[Beep] Bob’s computer alerted him to Leslie signing on to the Webex session. <Bob> Good afternoon Leslie, how are you? It seems a long time since we last chatted. <Leslie> Hi Bob. I am well and it has been a long time. If you remember, I had to loop out of the Health Care Systems Engineering training because I changed job, and it has taken me a while to bring a lot of fresh skeptics around to the idea of improvement-by-design. <Bob> Good to hear, and I assume you did that by demonstrating what was possible by doing it, delivering results, and describing the approach. <Leslie> Yup. And as you know, even with objective evidence of improvement it can take a while because that exposes another gap, the one between intent and impact. Many people get rather defensive at that point, so I have had to take it slowly. Some people get really fired up though. <Bob> Yes. Respect, challenge, patience and persistence are all needed. So, where shall we pick up? <Leslie> The old chestnut of winter pressures and A&E targets. Except that it is an all-year problem now and according to what I read in the news, everyone is predicting a ‘melt-down’. <Bob> Did you see last week’s IS blog on that very topic? <Leslie> Yes, I did! And that is what prompted me to contact you and to re-start my CHIPs coaching. It was a real eye opener. I liked the black swan code-named “RC9” story, it makes it sound like a James Bond film! <Bob> I wonder how many people dug deeper into how “RC9” achieved that rock-steady A&E performance despite a rising tide of arrivals and admissions? <Leslie> I did, and I saw several examples of anti-carve-out design. I have read though my notes and we have talked about carve out many times. <Bob> Excellent. Being able to see the signs of competent design is just as important as the symptoms of inept design. So, what shall we talk about? <Leslie> Well, by co-incidence I was sent a copy of of a report entitled “Understanding patient flow in hospitals” published by one of the leading Think Tanks and I confess it made no sense to me. Can we talk about that? <Bob> OK. Can you describe the essence of the report for me? <Leslie> Well, in a nutshell it said that flow needs space so if we want hospitals to flow better we need more space, in other words more beds. <Bob> And what evidence was presented to support that hypothesis? <Leslie> The authors equated the flow of patients through a hospital to the flow of traffic on a motorway. They presented a table of numbers that made no sense to me, I think partly because there are no units stated for some of the numbers … I’ll email you a picture. <Bob> I agree this is not a very informative table. I am not sure what the definition of “capacity” is here and it may be that the authors may be equating “hospital bed” to “area of tarmac”. 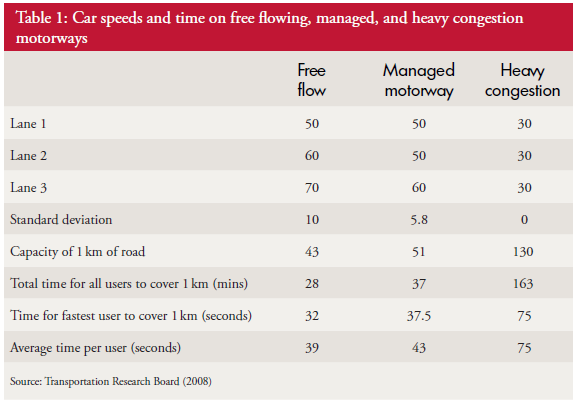 Anyway, the assertion that hospital flow is equivalent to motorway flow is inaccurate. There are some similarities and traffic engineering is an interesting subject, but they are not equivalent. A hospital is more like a busy city with junctions, cross-roads, traffic lights, roundabouts, zebra crossings, pelican crossings and all manner of unpredictable factors such as cyclists and pedestrians. Motorways are intentionally designed without these “impediments”, for obvious reasons! A complex adaptive flow system like a hospital cannot be equated to a motorway. It is a dangerous over-simplification. <Leslie> So, if the hospital-motorway analogy is invalid then the conclusions are also invalid? <Bob> Sometimes, by accident, we get a valid conclusion from an invalid method. What were the conclusions? <Leslie> That the solution to improving A&E performance is more space (i.e. hospital beds) but there is no more money to build them or people to staff them. So the recommendations are to reduce volume, redesign rehabilitation and discharge processes, and improve IT systems. <Bob> So just re-iterating the habitual exhortations and nothing about using well-understood systems engineering methods to accurately diagnose the actual root cause of the ‘symptoms’, which is likely to be the endemic carveoutosis multiforme, and then treat accordingly? <Leslie> No. I could not find the term “carve out” anywhere in the document. <Bob> Oh dear. Based on that observation, I do not believe this latest Think Tank report is going to be any more effective than the previous ones. Perhaps asking “RC9” to write an account of what they did and how they learned to do it would be more informative? They did not reduce volume, and I doubt they opened more beds, and their annual report suggests they identified some space and flow carveoutosis and treated it. That is what a competent systems engineer would do. <Leslie> Thanks Bob. Very helpful as always. What is my next step? <Bob> Some ISP-2 brain-teasers, a juicy ISP-2 project, and some one day training workshops for your all-fired-up CHIPs. It was the time for Bob and Leslie’s regular Improvement Science coaching session. <Leslie> Hi Bob, how are you today? <Bob> I am getting over a winter cold but otherwise I am good. And you? <Leslie> I am OK and I need to talk something through with you because I suspect you will be able to help. <Bob> OK. What is the context? <Leslie> Well, one of the projects that I am involved with is looking at the elderly unplanned admission stream which accounts for less than half of our unplanned admissions but more than half of our bed days. <Bob> OK. So what were you looking to improve? <Leslie> We want to reduce the average length of stay so that we free up beds to provide resilient space-capacity to ease the 4-hour A&E admission delay niggle. <Bob> That sounds like a very reasonable strategy. So have you made any changes and measured any improvements? <Leslie> We worked through the 6M Design® sequence. We studied the current system, diagnosed some time traps and bottlenecks, redesigned the ones we could influence, modified the system, and continued to measure to monitor the effect. <Leslie> It feels better but the system behaviour charts do not show an improvement. <Leslie> The BaseLine XmR charts of average length of stay for each week of activity. <Bob> And you locked the limits when you made the changes? <Leslie> Yes. And there still were no red flags. So that means our changes have not had a significant effect. But it definitely feels better. Am I deluding myself? <Bob> I do not believe so. Your subjective assessment is very likely to be accurate. Our Chimp OS 1.0 is very good at some things! I think the issue is with the tool you are using to measure the change. <Leslie> The XmR chart? But I thought that was THE tool to use? <Bob> Like all tools it is designed for a specific purpose. Are you familiar with the term Type II Error. <Leslie> Doesn’t that come from research? I seem to remember that is the error we make when we have an under-powered study. When our sample size is too small to confidently detect the change in the mean that we are looking for. <Bob> A perfect definition! The same error can happen when we are doing before and after studies too. And when it does, we see the pattern you have just described: the process feels better but we do not see any red flags on our BaseLine© chart. <Leslie> But if our changes only have a small effect how can it feel better? <Bob> Because some changes have cumulative effects and we omit to measure them. <Leslie> OMG! That makes complete sense! For example, if my bank balance is stable my average income and average expenses are balanced over time. So if I make a small-but-sustained improvement to my expenses, like using lower cost generic label products, then I will see a cumulative benefit over time to the balance, but not the monthly expenses; because the noise swamps the signal on that chart! <Leslie> So the XmR chart is not the tool for this job. And if this is the only tool we have then we risk making a Type II error. Is that correct? <Bob> Yes. We do still use an XmR chart first though, because if there is a big enough and fast enough shift then the XmR chart will reveal it. If there is not then we do not give up just yet; we reach for our more sensitive shift detector tool. <Bob> I will leave you to ponder on that question. You are a trained designer now so it is time to put your designer hat on and first consider the purpose of this new tool, and then create the outline a fit-for-purpose design. <Leslie> OK, I am on the case! It was the appointed time for Bob and Leslie’s regular coaching session as part of the improvement science practitioner programme. <Leslie> Hi Bob, I am feeling rather despondent today so please excuse me in advance if you hear a lot of “Yes, but …” language. <Bob> I am sorry to hear that Leslie. Do you want to talk about it? <Leslie> Yes, please. The trigger for my gloom was being sent on a mandatory training workshop. <Bob> OK. Training to do what? <Leslie> Outpatient demand and capacity planning! <Bob> But you know how to do that already, so what is the reason you were “sent”? <Leslie> Well, I am no longer sure I know how to it. That is why I am feeling so blue. I went more out of curiosity and I came away utterly confused and with my confidence shattered. <Bob> Oh dear! We had better start at the beginning. What was the purpose of the workshop? <Leslie> To train everyone in how to use an Outpatient Demand and Capacity planning model, an Excel one that we were told to download along with the User Guide. I think it is part of a national push to improve waiting times for outpatients. <Bob> OK. On the surface that sounds reasonable. You have designed and built your own Excel flow-models already; so where did the trouble start? <Leslie> I will attempt to explain. This was a paragraph in the instructions. I felt OK with this because my Improvement Science training has given me a very good understanding of basic demand and capacity theory. <Bob> OK. I am guessing that other delegates may have felt less comfortable with this. Was that the case? <Leslie> The training workshops are targeted at Operational Managers and the ones I spoke to actually felt that they had a good grasp of the basics. <Bob> OK. That is encouraging, but a warning bell is ringing for me. So where did the trouble start? <Bob> H’mm. What did you make of that? <Leslie> It was complete gibberish to me and I felt like an idiot for not understanding it. I went to the workshop in a bit of a panic and hoped that all would become clear. It didn’t. <Bob> Did the User Guide explain what ‘percentile’ means in this context, ideally with some visual charts to assist? <Leslie> No and the use of ‘th’ and ‘%’ was really confusing too. After that I sort of went into a mental fog and none of the workshop made much sense. It was all about practising using the tool without any understanding of how it worked. Like a black magic box. <Bob> OK. I can see why you were confused, and do not worry, you are not an idiot. It looks like the author of the User Guide has unwittingly used some very confusing and ambiguous terminology here. So can you talk me through what you have to do to use this magic box? <Leslie> First we have to enter some of our historical data; the number of new referrals per week for a year; and the referral and appointment dates for all patients for the most recent three months. <Bob> OK. That sounds very reasonable. A run chart of historical demand and the raw event data for a Vitals Chart® is where I would start the measurement phase too – so long as the data creates a valid 3 month reporting window. <Leslie> Yes, I though so too … but that is not how the black box model seems to work. The weekly demand is used to draw an SPC chart, but the event data seems to disappear into the innards of the black box, and recommendations pop out of it. <Bob> Ah ha! And let me guess the relationship between the term ‘percentile’ and the SPC chart of weekly new demand was not explained? <Leslie> Spot on. What does percentile mean? <Bob> It is statistics jargon. Remember that we have talked about the distribution of the data around the average on a BaseLine chart; and how we use the histogram feature of BaseLine to show it visually. Like this example. <Leslie> Yes. I recognise that. This chart shows a stable system of demand with an average of around 150 new referrals per week and the variation distributed above and below the average in a symmetrical pattern, falling off to zero around the upper and lower process limits. I believe that you said that over 99% will fall within the limits. <Bob> Good. The blue histogram on this chart is called a probability distribution function, to use the terminology of a statistician. 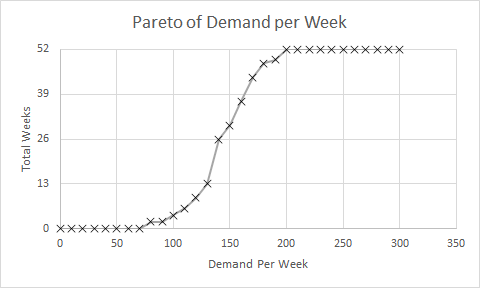 <Bob> So, what would happen if we created a Pareto chart of demand using the number of patients per week as the categories and ignoring the time aspect? We are allowed to do that if the behaviour is stable, as this chart suggests. <Leslie> Give me a minute, I will need to do a rough sketch. Does this look right? <Bob> Perfect! So if you now convert the Y-axis to a percentage scale so that 52 weeks is 100% then where does the average weekly demand of about 150 fall? Read up from the X-axis to the line then across to the Y-axis. <Leslie> At about 26 weeks or 50% of 52 weeks. Ah ha! So that is what a percentile means! The 50th percentile is the average, the zeroth percentile is around the lower process limit and the 100th percentile is around the upper process limit! <Bob> In this case the 50th percentile is the average, it is not always the case though. So where is the 85th percentile line? <Leslie> Um, 52 times 0.85 is 44.2 which, reading across from the Y-axis then down to the X-axis gives a weekly demand of about 170 per week. That is about the same as the average plus one sigma according to the run chart. <Bob> Excellent. The Pareto chart that you have drawn is called a cumulative probability distribution function … and that is usually what percentiles refer to. Comparative Statisticians love these but often omit to explain their rationale to non-statisticians! <Leslie> Phew! So, now I can see that the 65th percentile is just above average demand, and 85th percentile is above that. But in the confusing paragraph how does that relate to the phrase “65% and 85% of the time”? <Bob> It doesn’t. That is the really, really confusing part of that paragraph. I am not surprised that you looped out at that point! <Leslie> OK. Let us leave that for another conversation. If I ignore that bit then does the rest of it make sense? <Bob> Not yet alas. We need to dig a bit deeper. What would you say are the implications of this message? <Leslie> Well. I know that if our flow-capacity is less than our average demand then we will guarantee to create an unstable queue and chaos. That is the Flaw of Averages trap. <Bob> OK. The creator of this tool seems to know that. <Leslie> And my outpatient manager colleagues are always complaining that they do not have enough slots to book into, so I conclude that our current flow-capacity is just above the 50th percentile. <Leslie> So to calm the chaos the message is saying I will need to increase my flow capacity up to the 85th percentile of demand which is from about 150 slots per week to 170 slots per week. An increase of 7% which implies a 7% increase in costs. <Bob> Good. I am pleased that you did not fall into the intuitive trap that a increase from the 50th to the 85th percentile implies a 35/50 or 70% increase! Your estimate of 7% is a reasonable one. <Leslie> Well it may be theoretically reasonable but it is not practically possible. We are exhorted to reduce costs by at least that amount. <Bob> So we have a finance versus governance bun-fight with the operational managers caught in the middle: FOG. That is not the end of the litany of woes … is there anything about Did Not Attends in the model? <Leslie> Yes indeed! We are required to enter the percentage of DNAs and what we do with them. Do we discharge them or re-book them. <Bob> OK. Pragmatic reality is always much more interesting than academic rhetoric and this aspect of the real system rather complicates things, at least for a comparative statistician. This is where the smoke and mirrors will appear and they will be hidden inside the black magic box. To solve this conundrum we need to understand the relationship between demand, capacity, variation and yield … and it is rather counter-intuitive. So, how would you approach this problem? <Leslie> I would use the 6M Design® framework and I would start with a map and not with a model; least of all a magic black box one that I did not design, build and verify myself. <Bob> And how do you know that will work any better? <Leslie> Because at the One Day ISP Workshop I saw it work with my own eyes. The queues, waits and chaos just evaporated. And it cost nothing. We already had more than enough “capacity”. <Bob> Indeed you did. So shall we do this one as an ISP-2 project? <Leslie> An excellent suggestion. I already feel my confidence flowing back and I am looking forward to this new challenge. Thank you again Bob. But just saying that is not very helpful. We need to explain the reason why this conclusion is invalid and therefore potentially dangerous. So here is the continuation of Bob and Leslie’s conversation. <Bob> Hi Leslie, have you been reflecting on the two-points-in-time challenge? <Leslie> Yes indeed, and you were correct, I did know the answer … I just didn’t know I knew if you get my drift. <Bob> Yes, I do. So, are you willing to share your story? <Leslie> OK, but before I do that I would like to share what happened when I described what we talked about to some colleagues. They sort of got the idea but got lost in the unfamiliar language of ‘variance’ and I realized that I needed an example to illustrate. <Bob> Excellent … what example did you choose? 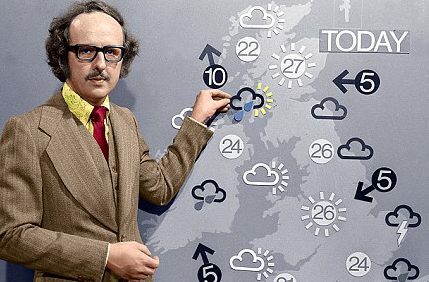 <Leslie> The UK weather – or more specifically the temperature. My reasons for choosing this were many: first it is something that everyone can relate to; secondly it has strong seasonal cycle; and thirdly because the data is readily available on the Internet. <Bob> OK, so what specific question were you trying to answer and what data did you use? <Leslie> The question was “Are our winters getting warmer?” and my interest in that is because many people assume that the colder the winter the more people suffer from respiratory illness and the more that go to hospital … contributing to the winter A&E and hospital pressures. The data that I used was the maximum monthly temperature from 1960 to the present recorded at our closest weather station. <Bob> OK, and what did you do with that data? <Leslie> Well, what I did not do was to compare this winter with last winter and draw my conclusion from that! What I did first was just to plot-the-dots … I created a time-series chart … using the BaseLine© software. And it shows what I expected to see, a strong, regular, 12-month cycle, with peaks in the summer and troughs in the winter. <Bob> Can you explain what the green and red lines are and why some dots are red? <Leslie> Sure. The green line is the average for all the data. The red lines are called the upper and lower process limits. They are calculated from the data and what they say is “if the variation in this data is random then we will expect more than 99% of the points to fall between these two red lines“. <Bob> So, we have 55 years of monthly data which is nearly 700 points which means we would expect fewer than seven to fall outside these lines … and we clearly have many more than that. For example, the winter of 1962-63 and the summer of 1976 look exceptional – a run of three consecutive dots outside the red lines. So can we conclude the variation we are seeing is not random? <Leslie> Yes, and there is more evidence to support that conclusion. First is the reality check … I do not remember either of those exceptionally cold or hot years personally, so I asked Dr Google. 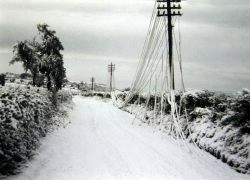 This picture from January 1963 shows copper telephone lines that are so weighed down with ice, and for so long, that they have stretched down to the ground. In this era of mobile phones we forget this was what telecommunication was like! And just look at the young Michal Fish in the Summer of ’76! Did people really wear clothes like that? And there is more evidence on the chart. The red dots that you mentioned are indicators that BaseLine© has detected other non-random patterns. So the large number of red dots confirms our Mark I Eyeball conclusion … that there are signals mixed up with the noise. <Bob> Actually, I do remember the Summer of ’76 – it was the year I did my O Levels! And your signals-in-the-noise phrase reminds me of SETI – the search for extra-terrestrial intelligence! I really enjoyed the 1997 film of Carl Sagan’s book Contact with Jodi Foster playing the role of the determined scientist who ends up taking a faster-than-light trip through space in a machine designed by ET and built by humans. And especially the line about 10 minutes from the end when those-in-high-places who had discounted her story as “unbelievable” realized they may have made an error … the line ‘Yes, that is interesting isn’t it’. <Leslie> Ha ha! Yes. I enjoyed that film too. It had lots of great characters – her glory seeking boss; the hyper-suspicious head of national security who militarized the project; the charismatic anti-hero; the ranting radical who blew up the first alien machine; and John Hurt as her guardian angel. I must watch it again. Anyway, back to the story. The problem we have here is that this type of time-series chart is not designed to extract the overwhelming cyclical, annual pattern so that we can search for any weaker signals … such as a smaller change in winter temperature over a longer period of time. <Bob>Yes, that is indeed the problem with these statistical process control charts. SPC charts were designed over 60 years ago for process quality assurance in manufacturing not as a diagnostic tool in a complex adaptive system such a healthcare. So how did you solve the problem? <Leslie> I realized that it was the regularity of the cyclical pattern that was the key. I realized that I could use that to separate out the annual cycle and to expose the weaker signals. I did that using the rational grouping feature of BaseLine© with the month-of-the-year as the group. Now I realize why the designers of the software put this feature in! With just one mouse click the story jumped out of the screen! <Bob> OK. So can you explain what we are looking at here? <Leslie> Sure. This chart shows the same data as before except that I asked BaseLine© first to group the data by month and then to create a mini-chart for each month-group independently. Each group has its own average and process limits. So if we look at the pattern of the averages, the green lines, we can clearly see the annual cycle. What is very obvious now is that the process limits for each sub-group are much narrower, and that there are now very few red points … other than in the groups that are coloured red anyway … a niggle that the designers need to nail in my opinion! <Bob> I will pass on your improvement suggestion! So are you saying that the regular annual cycle has accounted for the majority of the signal in the previous chart and that now we have extracted that signal we can look for weaker signals by looking for red flags in each monthly group? <Leslie> Exactly so. And the groups I am most interested in are the November to March ones. So, next I filtered out the November data and plotted it as a separate chart; and I then used another cool feature of BaseLine© called limit locking. 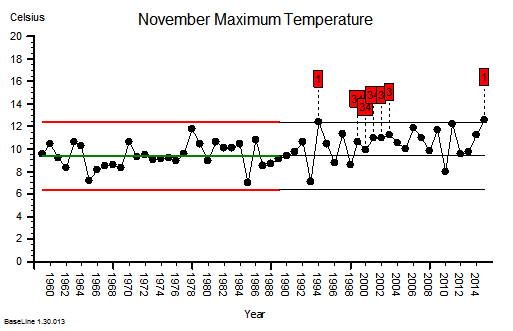 What that means is that I have used the November maximum temperature data for the first 30 years to get the baseline average and natural process limits … and we can see that there are no red flags in that section, no obvious signals. Then I locked these limits at 1990 and this tells BaseLine© to compare the subsequent 25 years of data against these projected limits. That exposed a lot of signal flags, and we can clearly see that most of the points in the later section are above the projected average from the earlier one. This confirms that there has been a significant increase in November maximum temperature over this 55 year period. <Bob> Excellent! You have answered part of your question. So what about December onwards? <Leslie> I was on a roll now! I also noticed from my second chart that the December, January and February groups looked rather similar so I filtered that data out and plotted them as a separate chart. These were indeed almost identical so I lumped them together as a ‘winter’ group and compared the earlier half with the later half using another BaseLine© feature called segmentation. 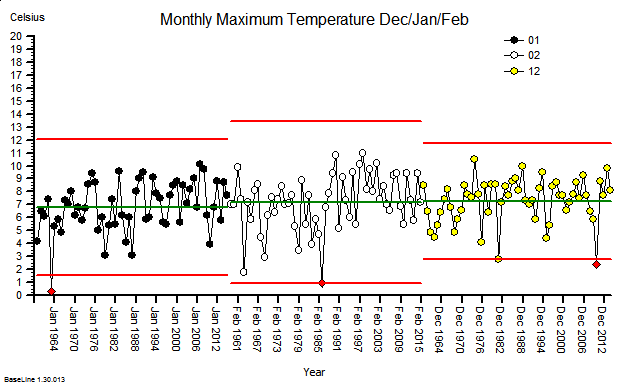 This showed that the more recent winter months have a higher maximum temperature … on average. The difference is just over one degree Celsius. But it also shows that that the month-to-month and year-to-year variation still dominates the picture. <Leslie> That, with data like this, a two-points-in-time comparison is meaningless. If we do that we are just sampling random noise and there is no useful information in noise. Nothing that we can learn from. Nothing that we can justify a decision with. This is the reason the ‘this year was better than last year’ statement is meaningless at best; and dangerous at worst. Dangerous because if we draw an invalid conclusion, then it can lead us to make an unwise decision, then decide a counter-productive action, and then deliver an unintended outcome. By doing invalid two-point comparisons we can too easily make the problem worse … not better. <Bob> Yes. This is what W. Edwards Deming, an early guru of improvement science, referred to as ‘tampering‘. He was a student of Walter A. Shewhart who recognized this problem in manufacturing and, in 1924, invented the first control chart to highlight it, and so prevent it. My grandmother used the term meddling to describe this same behavior … and I now use that term as one of the eight sources of variation. Well done Leslie! [Bzzzzzz] Bob’s phone vibrated to remind him it was time for the regular ISP remote coaching session with Leslie. He flipped the lid of his laptop just as Leslie joined the virtual meeting. <Leslie> Hi Bob, and Happy New Year! <Bob> Hello Leslie and I wish you well in 2016 too. So, what shall we talk about today? <Leslie> Well, given the time of year I suppose it should be the Winter Crisis. The regularly repeating annual winter crisis. The one that feels more like the perpetual winter crisis. <Bob> OK. What specifically would you like to explore? <Leslie> Specifically? The habit of comparing of this year with last year to answer the burning question “Are we doing better, the same or worse?” Especially given the enormous effort and political attention that has been focused on the hot potato of A&E 4-hour performance. <Bob> Aaaaah! That old chestnut! Two-Points-In-Time comparison. <Leslie> Yes. I seem to recall you usually add the word ‘meaningless’ to that phrase. <Bob> H’mm. Yes. It can certainly become that, but there is a perfectly good reason why we do this. <Leslie> Indeed, it is because we see seasonal cycles in the data so we only want to compare the same parts of the seasonal cycle with each other. The apples and oranges thing. <Bob> Yes, that is part of it. So what do you feel is the problem? <Leslie> It feels like a lottery! It feels like whether we appear to be better or worse is just the outcome of a random toss. <Bob> And we need a scientifically robust way to answer it. One that we can all trust. <Bob> So how do you decide that now in your improvement work? 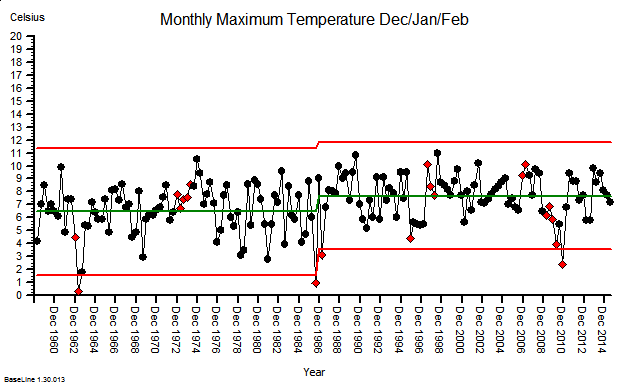 How do you do it when you have data that does not show a seasonal cycle? <Leslie> I plot-the-dots and use an XmR chart to alert me to the presence of the signals I am interested in – especially a change of the mean. <Bob> Good. So why can we not use that approach here? <Leslie> Because the seasonal cycle is usually a big signal and it can swamp the smaller change I am looking for. <Bob> Exactly so. Which is why we have to abandon the XmR chart and fall back the two points in time comparison? <Leslie> That is what I see. That is the argument I am presented with and I have no answer. <Bob> OK. It is important to appreciate that the XmR chart was not designed for doing this. It was designed for monitoring the output quality of a stable and capable process. It was designed to look for early warning signs; small but significant signals that suggest future problems. The purpose is to alert us so that we can identify the root causes, correct them and the avoid a future problem. <Leslie> So we are using the wrong tool for the job. I sort of knew that. But surely there must be a better way than a two-points-in-time comparison! <Bob> There is, but first we need to understand why a TPIT is a poor design. <Leslie> Excellent. I’m all ears. <Bob> A two point comparison is looking at the difference between two values, and that difference can be positive, zero or negative. In fact, it is very unlikely to be zero because noise is always present. <Bob> Now, both of the values we are comparing are single samples from two bigger pools of data. It is the difference between the pools that we are interested in but we only have single samples of each one … so they are not measurements … they are estimates. <Leslie> So, when we do a TPIT comparison we are looking at the difference between two samples that come from two pools that have inherent variation and may or may not actually be different. <Bob> Well put. We give that inherent variation a name … we call it variance … and we can quantify it. <Leslie> So if we do many TPIT comparisons then they will show variation as well … for two reasons; first because the pools we are sampling have inherent variation; and second just from the process of sampling itself. It was the first lesson in the ISP-1 course. <Leslie> My intuition tells me that it will be less because we are subtracting. <Bob> Your intuition is half-right. The effect of the variation caused by the signal will be less … that is the rationale for the TPIT after all … but the same does not hold for the noise. <Leslie> So the noise variation in the TPIT is the same? <Bob> No. It is increased. <Leslie> What! But that would imply that when we do this we are less likely to be able to detect a change because a small shift in signal will be swamped by the increase in the noise! <Bob> Precisely. And the degree that the variance increases by is mathematically predictable … it is increased by a factor of two. <Leslie> I need to put this counter-intuitive theory to the test! <Bob> Excellent. Accept nothing on faith. Always test assumptions. And how will you do that? <Leslie> I will use Excel to generate a big series of normally distributed random numbers; then I will calculate a series of TPIT differences using a fixed time interval; then I will calculate the means and variations of the two sets of data; and then I will compare them. <Bob> Excellent. Let us reconvene in ten minutes when you have done that. <Leslie> Hi Bob, OK I am ready and I would like to present the results as charts. Is that OK? <Leslie> Here is the first one. I used our A&E performance data to give me some context. We know that on Mondays we have an average of 210 arrivals with an approximately normal distribution and a standard deviation of 44; so I used these values to generate the random numbers. Here is the simulated Monday Arrivals chart for two years. <Bob> OK. It looks stable as we would expect and I see that you have plotted the sigma levels which look to be just under 50 wide. <Leslie> Yes, it shows that my simulation is working. So next is the chart of the comparison of arrivals for each Monday in Year 2 compared with the corresponding week in Year 1. <Bob> Oooookaaaaay. What have we here? Another stable chart with a mean of about zero. That is what we would expect given that there has not been a change in the average from Year 1 to Year 2. And the variation has increased … sigma looks to be just over 60. <Leslie> Yes! Just as the theory predicted. And this is not a spurious answer. I ran the simulation dozens of times and the effect is consistent! So, I am forced by reality to accept the conclusion that when we do two-point-in-time comparisons to eliminate a cyclical signal we will reduce the sensitivity of our test and make it harder to detect other signals. <Bob> Good work Leslie! Now that you have demonstrated this to yourself using a carefully designed and conducted simulation experiment, you will be better able to explain it to others. <Leslie> So how do we avoid this problem? <Bob> An excellent question and one that I will ask you to ponder on until our next chat. You know the answer to this … you just need to bring it to conscious awareness. Dr Bob runs a Clinic for Sick Systems and is sharing the Case of St Elsewhere’s® Hospital which is suffering from chronic pain in their A&E department. The story so far: The history and examination of St.Elsewhere’s® Emergency Flow System have revealed that the underlying disease includes carveoutosis multiforme. StE has consented to a knowledge transplant but is suffering symptoms of disbelief – the emotional rejection of the new reality. Dr Bob prescribed some loosening up exercises using the Carveoutosis Game. This is the appointment to review the progress. <Dr Bob> Hello again. I hope you have done the exercises as we agreed. <StE> Indeed we have. Many times in fact because at first we could not believe what we were seeing. We even modified the game to explore the ramifications. And we have an apology to make. We discounted what you said last week but you were absolutely correct. <Dr Bob> I am delighted to hear that you have explored further and I applaud you for the curiosity and courage in doing that. There is no need to apologize. If this flow science was intuitively obvious then we we would not be having this conversation. So, how have you used the new understanding? <StE> Before we tell the story of what happened next we are curious to know where you learned about this? <Dr Bob> The pathogenesis of carveoutosis spatialis has been known for about 100 years but in a different context. The story goes back to the 1870s when Alexander Graham Bell invented the telephone. He was not an engineer or mathematician by background; he was interested in phonetics and he was a pragmatist and experimented by making things. He invented the telephone and the Bell Telephone Co. was born. This innovation spread like wildfire, as you can imagine, and by the early 1900’s there were many telephone companies all over the world. At that time the connections were made manually by telephone operators using patch boards and the growing demand created a new problem. How many lines and operators were needed to provide a high quality service to bill paying customers? In other words … to achieve an acceptably low chance of hearing the reply “I’m sorry but all lines are busy, please try again later“. Adding new lines and more operators was a slow and expensive business so they needed a way to predict how many would be needed – and how to do that was not obvious! In 1917, a Danish mathematician, statistician and engineer called Agner Krarup Erlang published a paper with the solution. A complicated formula that described the relationship and his Erlang B equation allowed telephone exchanges to be designed, built and staffed and to provide a high quality service at an acceptably low cost. Mass real-time voice communication by telephone became affordable and has transformed the world. <StE> Fascinating! We sort of sense there is a link here and certainly the “high quality and low cost” message resonates for us. But how does designing telephone exchanges relate to hospital beds? <Dr Bob> If we equate an emergency admission needing a bed to a customer making a phone call, and we equate the number of telephone lines to the number of beds, then the two systems are very similar from the flow physics perspective. Erlang’s scary-looking equation can be used to estimate the minimum number of beds needed to achieve any specified level of admission service quality if you know the average rate of demand and average the length of stay. That is how I made the estimate last week. It is this predictable-within-limits behaviour that you demonstrated to yourself with the Carveoutosis Game. <StE> And this has been known for nearly 100 years but we have only just learned about it! <Dr Bob> Yes. That is a bit annoying isn’t it? <StE> And that explains why when we ‘ring-fence’ our fixed stock of beds the 4-hour performance falls! <Dr Bob> Yes, that is a valid assertion. By doing that you are reducing your space-capacity resilience and the resulting danger, chaos, disappointment and escalating cost is completely predictable. <StE> So our pain is iatrogenic as you said! We have unwittingly caused this. That is uncomfortable news to hear. <Dr Bob> The root cause is actually not what you have done wrong, it is what you have not done right. It is an error of omission. You have not learned to listen to what your system is telling you. You have not learned how that can help you to deepen your understanding of how your system works. It is that information, knowledge, understanding and wisdom that you need to design a safer, calmer, higher quality and more affordable healthcare system. <StE> And now we can see our omission … before it was like a blind spot … and now we can see the fallacy of our previously deeply held belief: that it was impossible to solve this without more beds, more staff and more money. The gap is now obvious where before it was invisible. It is like a light has been turned on. Now we know what to do and we are on the road to recovery. We need to learn how to do this ourselves … but not by guessing and meddling … we need to learn to diagnose and then to design and then to deliver safety, flow, quality and productivity. All at the same time. <Dr Bob> Welcome to the world of Improvement Science. And here I must sound a note of caution … there is a lot more to it than just blindly applying Erlang’s B equation. That will get us into the ball-park, which is a big leap forward, but real systems are not just simple, passive games of chance; they are complicated, active and adaptive. Applying the principles of flow design in that context requires more than just mathematics, statistics and computer models. But that know-how is available and accessible too … and waiting for when you are ready to take that leap of learning. OK. I do not think you require any more help from me at this stage. You have what you need and I wish you well. And please let me know the outcome. <StE> Thank you and rest assured we will. We have already started writing our story … and we wanted to share the that with you today … but with this new insight we will need to write a few more chapters first. This is really exciting … thank you so much. Part 1 is here. Part 2 is here. Part 3 is here. Part 4 is here. Part 5 is here. The story so far: The history and examination of St.Elsewhere’s® Emergency Flow System have revealed the footprint of a Horned Gaussian in their raw A&E data. This characteristic sign suggests that the underlying disease includes carveoutosis. StE has signed up for treatment and has started by installing learning loops. This is the one week follow up appointment. <Dr Bob> Hi there. How are things? What has changed this week? <StE> Lots! We shared the eureka moment we had when you described the symptoms, signs and pathogenesis of carvoutosis temporalis using the Friday Afternoon Snail Mail story. That resonated strongly with lots of people. And as a result that symptom has almost gone – as if by magic! We are now keeping on top of our emails by doing a few each day and we are seeing decisions and actions happening much more quickly. <Dr Bob> Excellent. Many find it surprising to see such a large beneficial impact from such an apparently small change. And how are you feeling overall? How is the other pain? <StE> Still there unfortunately. Our A&E performance has not really improved but we do feel a new sense of purpose, determination and almost optimism. It is hard to put a finger on it. <Dr Bob> Does it feel like a paradoxical combination of “feels subjectively better but looks objectively the same”? <StE> Yes, that’s exactly it. And it is really confusing. Are we just fire-fighting more quickly but still not putting out the fire? <Dr Bob> Possibly. It depends on your decisions and actions … you may be unwittingly both fighting and fanning the fire at the same time. It may be that you are suffering from carveoutosis multiforme. <Dr Bob> No. Just trickier to diagnose and treat. It implies that there is more than one type of carveoutosis active at the same time and they tend to amplify each other. The other common type is called carveoutosis spatialis. Shall we explore that hypothesis? <StE> Um, OK. Does it require more painful poking? <Dr Bob> A bit. Do you want to proceed? I cannot do so without your consent. <Dr Bob> OK. Can you describe for me what happens to emergency patients after they are admitted. Where do they go to? <StE> That’s easy. The medical emergencies go to the medical wards and the others go to the surgical wards. Or rather they should. Very often there is spillover from one to the other because the specialty wards are full. That generates a lot of grumbling from everyone … doctors, nurses and patients. We call them outliers. <Dr Bob> And when a patient gets to a ward where do they go? Into any available empty bed? <StE> No. We have to keep males and females separate, to maintain privacy and dignity. We get really badly beaten up if we mix them. Our wards are split up into six-bedded bays and a few single side-rooms, and we are constantly juggling bays and swapping them from male to female and back. Often moving patients around in the process, and often late at night. The patients do not like it and it creates lots of extra work for the nurses. <Dr Bob> And when did these specialty and gender segregation policies come into force? <StE> The specialty split goes back decades, the gender split was introduced after StE was built. We were told that it wouldn’t make any difference because we are still admitting the same proportion of males and females so it would average out, but it causes us a lot of headaches! Maybe we are now having to admit more patients than the hospital was designed to hold! <Dr Bob> That is possible, but even if you were admitting the same number for the same length of time the symptoms of carveoutosis spatialis are quite predictable. When there is any form of variation in demand, casemix, or gender then if you split your space-capacity into ‘ring-fenced’ areas you will always need more total space-capacity to achieve the same waiting time performance. Always. It is mandated by the Laws of Physics. It is not negotiable. And it does not average out. <StE> What! So we were mis-informed? The chaos we are seeing was predictable? <Dr Bob> The effect of carveoutosis spatialis is predictable. But knowing that does not prove it is the sole cause of the chaos you are experiencing. It may well be a contributory factor though. <StE> So how big an effect are we talking about here? A few percent? <Dr Bob> I can estimate it for you. What are your average number of emergency admissions per day, the split between medical and surgical, the split between gender, and the average length of stay in each group? <StE> We have an average of sixty emergency admissions per day, the split between medicine and surgery is 50:50 on average; the gender split is 50:50 on average and the average LoS in each of those 4 groups is 8 days. We worked out using these number that we should need 480 beds but even now we have about 540 and even that doesn’t seem to be enough! <Dr Bob> OK, let me work this out … with those parameters and assuming that the LoS does not change then the Laws of Flow Physics predict that you would need about 25% more beds than 480 – nearer six hundred – to be confident that there will always be a free bed for the next emergency admission in all four categories of patient. <StE> What! Our Director of Finance has just fallen off his chair! That can’t be correct! But that is exactly what we are seeing. If we we were able to treated this carvoutosis spatialis … if, just for the sake of argument, we could put any patient into any available bed … what effect would that have? Would we then only need 480 beds? <Dr Bob> You would if there was absolutely zero variation of any sort … but that is impossible. If nothing else changed the Laws of Physics predict that you would need about 520 beds. <StE> What! But we have 540 beds now. Are you saying our whole A&E headache would evaporate just by doing that … and we would still have beds to spare? <Dr Bob> That would be my prognosis, assuming there are no other factors at play that we have not explored yet. <StE> Now the Head of Governance has just exploded! This is getting messy! We cannot just abandon the privacy and dignity policy. But there isn’t much privacy or dignity lying on a trolley in the A&E corridor for hours! We’re really sorry Dr Bob but we cannot believe you. We need proof. <Dr Bob> And so would I were I in your position. Would you like to prove it to yourselves? I have a game you can play that will demonstrate this unavoidable consequence of the Laws of Physics. Would you like to play it? <Dr Bob> OK. Here are the instructions for the game. This is your homework for this week. See you next week. Dr Bob runs a Clinic for Sick Systems and is sharing the Case of St Elsewhere’s ® Hospital which is suffering from chronic pain in the A&E department. Dr Bob is presenting the case study in weekly bite-sized bits that are ample food for thought. The history and initial examination of St.Elsewhere’s® Emergency Flow System have revealed the footprint of a Horned Gaussian in their raw A&E data. That characteristic sign suggests that the underlying disease complex includes one or more forms of carveoutosis. So that is what Dr Bob and StE will need to explore together. <Dr Bob> Hello again and how are you feeling since our last conversation? <StE> Actually, although the A&E pain continues unabated, we feel better. More optimistic. 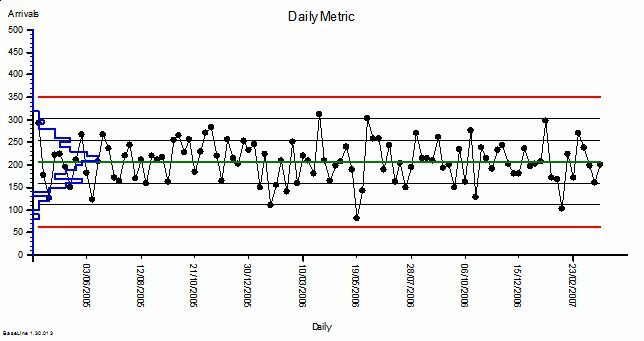 We have followed your advice and have been plotting our daily A&E time-series charts and sharing those with the front-line staff. And what is interesting to observe is the effect of just doing that. There are fewer “What you should do!” statements and more “What we could do …” conversations starting to happen – right at the front line. <Dr Bob> Excellent. That is what usually happens when we switch on the fast feedback loop. I detect that you are already feeling the emotional benefit. So now we need to explore carveoutosis. Are you up for that? <Dr Bob> OK. The common pathology in carveoutosis is that we have some form of resource that we, literally, carve up into a larger number of smaller pieces. It does not matter what the resource is. It can be time, space, knowledge, skill, cash. Anything. <StE> Um, that is a bit abstract. Can you explain with a real example? <Dr Bob> OK. I will use the example of temporal carveoutosis. Do you use email? And if so what are your frustrations with it … your Niggles? <StE> Ouch! You poked a tender spot with that question! Email is one of our biggest sources of frustration. A relentless influx of dross that needs careful scanning to filter out the important stuff. We waste hours every week on this hamster wheel. And if we do not clear our Inboxes by close of play on Friday then the following week is even worse! <Dr Bob> And how many of you put time aside on Friday afternoon to ‘Clear-the-Inbox’? <StE> We all do. It does at least give us some sense of control amidst the chaos. <Dr Bob> OK. This is a perfect example of temporal carveoutosis. Suppose we consider the extreme case where we only process our emails on a Friday afternoon in a chunk of protected time carved out of our diary. Now consider the effect of our carved-out-time-policy on the flow of emails. What happens? <StE> Well, if we all do this then we will only send emails on a Friday afternoon and the person we are sending them to will only read them the following Friday afternoon and if we need a reply we will read that the Friday after. So the time from sending an email to getting a reply will be two weeks. And it does not make any difference how many emails we send! <Dr Bob> Yes. That is the effect on the lead-time … but I asked what the effect was on flow? <StE> Oops! So our answer was correct but that was not the question you asked. Um, the effect on flow is that it will be very jerky. Emails will only flow on Friday afternoons … so all the emails for the week will try to flow around in a few hours or minutes. Ah! That may explain why the email system seems to slow down on Friday afternoons and that only delays the work and adds to our frustration! We naturally assumed it was because the IT department have not invested enough in hardware! Faster computers and bigger mailboxes! <Dr Bob> What you are seeing is the inevitable and predictable effect of one form of temporal carveoutosis. The technical name for this is a QBQ time trap and it is an iatrogenic disease. Self-inflicted. (QBQ=queue-batch-queue). <StE> So if the IT Department actually had the budget, and if they had actually treated the ear-ache we were giving them, and if they had actually invested in faster and bigger computers then the symptom of Friday Snail Mail would go away – but the time trap would remain. And it might actually reinforce our emails-only-on-a-Friday-afternoon behaviour! Wow! That was not obvious until you forced us to think it through logically. Dr Bob runs a Clinic for Sick Systems and is sharing the story of a recent case – a hospital that has presented with chronic pain in their A&E department. It is a complicated story so Dr Bob is presenting it in bite-sized bits that only require a few minutes to read. Part 1 is here. Part 2 is here. The patient is St.Elsewhere’s® Hospital, a medium sized district general hospital situated in mid-England. 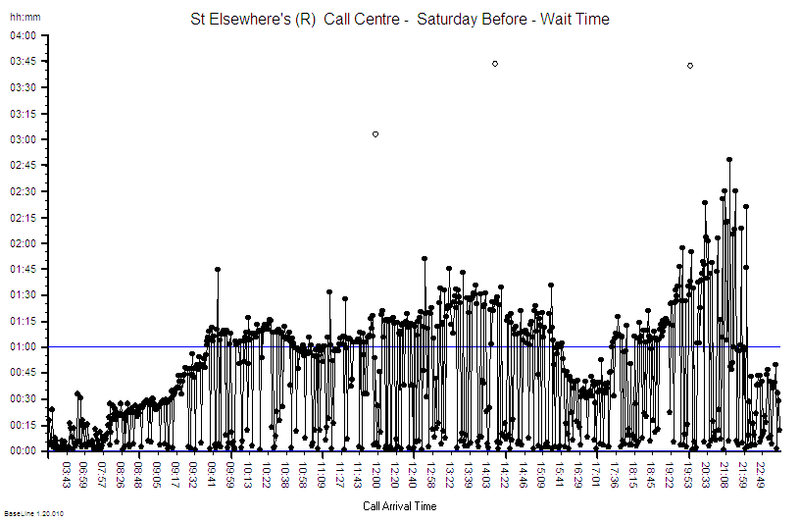 StE has a type-1 A&E Department that receives about 200 A&E arrivals per day which is rather average. StE is suffering with chronic pain – specifically the emotional, operational, cultural and financial pain caused by failing their 4-hour A&E target. Their Paymasters and Inspectors have the thumbscrews on, and each quarter … when StE publish their performance report that shows they have failed their A&E target (again) … the thumbscrews are tightened a few more clicks. Arrrrrrrrrrrrgh. 1) To calculate their daily and quarterly 4-hour target failure rate. 2) To create action plans that they believe will eliminate their pain-of-failure. 3) To expedite patients who are approaching the 4-hour target – because that eases the pain. But the action plans do not appear to have worked and, despite their heroic expeditionary effort, the chronic pain is getting worse. StE is desperate and has finally accepted that it needs help. The Board are worried that they might not survive the coming winter storm and when they hear whispers of P45s being armed and aimed by the P&I then they are finally scared enough to seek professional advice. So they Choose&Book an urgent appointment at Dr Bob’s clinic … and they want a solution yesterday … but they fear the worst. They fear discovering that there is no solution! The Board, the operational managers and the senior clinicians feel like they are between a rock and a hard place. If Dr Bob’s diagnosis is ‘terminal’ then they cannot avert the launch of the P45’s and it is Game Over for the Board and probably for StE as well. And if Dr Bob’s diagnosis is ‘treatable’ then they cannot avert accepting the painful exposure of their past and present ineptitude – particularly if the prescribed humble pie is swallowed and has the desired effect of curing the A&E pain. So whatever the diagnosis they appear to have an uncomfortable choice: leave or learn? 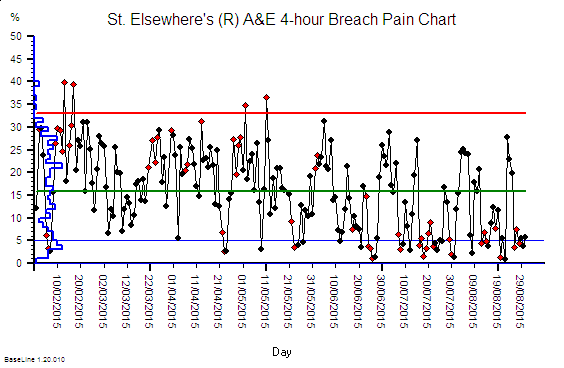 Dr Bob has been looking at the A&E data for one typical week that StE have shared. And Dr Bob knows what to look for … the footprint of a dangerous yet elusive disease. A characteristic sign that doctors have a name for … a pathognomic sign. Dr Bob is looking for the Horned Gaussian … and has found it! So now Dr Bob has to deliver the bittersweet news to the patient. <Dr Bob> Hello again. Please sit down and make yourselves comfortable. As you know I have been doing some tests on the A&E data that you shared. I have the results of those tests and I need to be completely candid with you. There is good news and there is not-so-good news. Would you like to hear this news and if so … in what order? <StE> Oh dear. We were hoping there was only good news so perhaps we should start there. <Dr Bob> OK. The good news is that you appear to be suffering from a treatable disease. The data shows the unmistakable footprint of a Horned Gaussian. <StE> Phew! Thank the Stars! That is what we had hoped and prayed for! Thank you so much. You cannot imagine how much better we feel already. But what is the not-so-good news? <Dr Bob> The not-so-good news is that the disease is iatrogenic which is medical jargon for self-inflicted. And I appreciate that you did not do this knowingly so you should not feel guilt or blame for doing things that you did not know are self-defeating. And in order to treat this disease we have to treat the root cause and that implies you have a simple choice to make. <StE> Actually, what you are saying does not come as a surprise. We have sensed for some time that there was something that we did not really understand but we have been so consumed by fighting-the-fire that we have prevaricated in grasping that nettle. And we think we know what the choice is: to leave or to learn. Continuing as we are is no longer an option. <Dr Bob> You are correct. That is the choice. StE confers and unanimously choose to take the more courageous path … they choose to learn. <StE> We choose to learn. Can we start immediately? Can you teach us about the Horned Gaussian? <Dr Bob> Of course, but before that we need to understand what a Gaussian is. Suppose we have some very special sixty-sided dice with faces numbered 1 to 59, and suppose we toss six of them and wait until they come to rest. Then suppose we count up the total score on the topmost facet of each die … and then suppose we write that total down. And suppose we do this 1500 times and then calculate the average total score. What do you suppose the average would be … approximately? <StE> Well … the score on each die can be between 1 and 59 and each number is equally likely to happen … so the average score for 1500 throws of one die will be about 30 … so the average score for six of these mega-dice will be about 180. <Dr Bob> Excellent. And how will the total score vary from throw to throw? <StE> H’mm … tricky. We know that it will vary but our intuition does not tell us by how much. 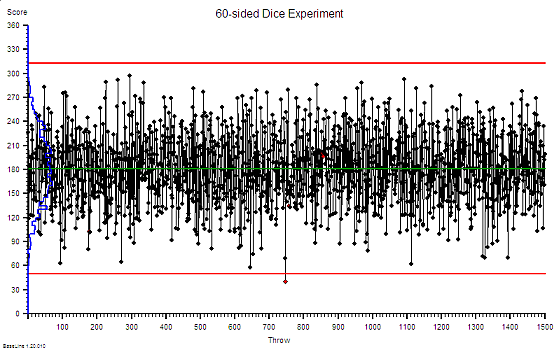 Notice that there is rather a wide spread around our expected average of 180 and remember that this is just tossing a handful of sixty-sided dice … so this variation is random … it is inherent and expected and we have no influence over it. Notice too that on the left the distribution of the scores is plotted as a histogram … the blue line. Notice the symmetrical hump-like shape … this is the footprint of a Gaussian. <StE> So what? This is a bit abstract and theoretical for us. How does it help us? <Dr Bob> Please bear with me a little longer. 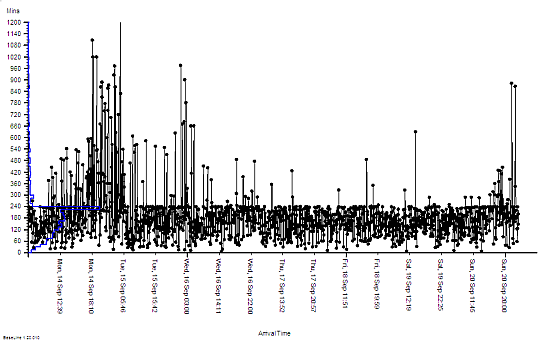 I have also plotted the time that each of your patients were in A&E last week on the same sort of chart. What do you notice? <StE> H’mm. This is very odd. It looks like someone has taken a blunt razor to the data … they fluffed the first bit but sharpened up their act for the rest of it. And the histogram looks a bit like the one on your chart, well the lower half does, then there is a big spike. Is that the Horned thingamy? <Dr Bob> Yes. This is the footprint of a Horned Gaussian. What this picture of your data says is that something is distorting the natural behaviour of your A&E system and that something is cutting in at 240 minutes. Four hours. <StE> Wait a minute! That is exactly what we do. We admit patients who are getting close to the 4-hour target to stop the A&E clock and reduce the pain of 4-hour failure. But we can only admit as many as we have space for … and sometimes we run out of space. That happened last Monday evening. The whole of StE hospital was gridlocked and we had no option but to store the A&E patients in the corridors – some for more than 12 hours! Just as the chart shows. <Dr Bob> And by distorting your natural system behaviour in this way you are also distorting the data. Your 4-hour breach rate is actually a lot lower that it would otherwise be … until the system gridlocks then it goes through the roof. This design is unstable and unsafe. Are Mondays always like this? <StE> Usually, yes. Tuesday feels less painful and the agony eases up to Friday then it builds up again. It is worse than Groundhog Day … it is more like Groundhog Week! The chaos and firefighting is continuous though, particularly in the late afternoon and evenings. <Dr Bob> So now we are gaining some understanding. The uncomfortable discovery when we look in the mirror is that: part of the cause is our own policies that create the symptoms and obscure the disease. We have looked in the mirror and “we have seen the enemy and the enemy is us“. This is an iatrogenic disease and in my experience a common root cause is something called carveoutosis. Understanding the pathogenesis of carveoutosis is the path to understanding what is needed to treat it. Are you up for that? <StE> You bet we are! St.Elsewhere’s® is a registered trademark of Kate Silvester Ltd. This week we will continue to explore the Case of Chronic Pain in the A&E Department of St.Elsewhere’s Hospital. Last week we started by ‘taking a history’. We asked about symptoms and we asked about the time patterns and associations of those symptoms. The subjective stuff. And as we studied the pattern of symptoms a list of plausible diagnoses started to form … with chronic carveoutosis as a hot contender. Carveoutosis is a group of related system diseases that have a common theme. So if we find objective evidence of carveoutosis then we will talk about it … but for now we need to keep an open mind. The next step is to ‘examine the patient’ – which means that we use the pattern of symptoms to focus our attention on seeking objective signs that will help us to prune our differential diagnosis. But first we need to be clear what the pain actually is. We need a more detailed description. <Dr Bob> Can you explain to me what the ‘4-hour target’ is? <StE> Of course. When a new patient arrives at our A&E Department we start a clock for that patient, and when the patient leaves we stop their clock. Then we work out how long they were in the A&E Department and we count the number that were longer than 4-hours for each day. Then we divide this number by the number of patients who arrived that day to give us a percentage: a 4-hour target failure rate. Then we average those daily rates over three months to give us our Quarterly 4-hour A&E Target Performance; one of the Key Performance Indicators (KPIs) that are written into our contract and which we are required to send to our Paymasters and Inspectors. If that is more than 5% we are in breach of our contract and we get into big trouble, if it is less than 5% we get left alone. Or to be more precise the Board get into big trouble and they share the pain with us. <Dr Bob> That is much clearer now. Do you know how many new patients arrive in A&E each day, on average. <StE> About two hundred, but it varies quite a lot from day-to-day. That implies that more than 99.99% of the available information is not used. Which is like driving on a mountain road at night with your lights on but your eyes closed! Dangerous and scary! Dr Bob now has a further addition to his list of diagnoses: amaurosis agnosias which roughly translated means ‘turning a blind eye’. <Dr Bob> Can I ask how you use this clock information in your minute-to-minute management of patients? <StE> Well for the first three hours we do not use it … we just get on with managing the patients. Some are higher priority and more complicated than others, we call them Majors and we put them in the Majors Area. Some are lower priority and easier so we call them Minors and we put them in the Minors Area. Our doctors and nurses then run around looking after the highest clinical priority patients first … for obvious reasons. However, as a patient’s clock starts to get closer to 4-hours then that takes priority and those patients start to leapfrog up the queue of who to see next. We have found that this is an easy and effective way to improve our 4-hour performance. It can make the difference between passing or failing a quarter and reducing our referred pain! To assist us implement the Leapfrog Policy our Board have invested in some impressive digital technology … a huge computer monitor on the wall that shows exactly who is closest to the 4-hour target. This makes it much easier for us to see which patients needs to be leapfrogged for decision and action. <Dr Bob> Do you, by any chance, keep any of the individual patient clock data? <StE> Yes, we have to do that because we are required to complete a report each week for the causes of 4-hour failures and we also have to submit an Action Plan for how we will eliminate them. So we keep the data and then spend hours going back through the thousands of A&E cards to identify what we think are the causes of the delays. There are lots of causes and many patients are affected by more than one; and there does not appear to be any clear pattern … other than ‘too busy’. So our action plan is the same each week … write yet another business case asking for more staff and for more space. <Dr Bob> Could you send me some of that raw clock data? Anonymous of course. I just need the arrival date and time and the departure date and time for an average week. <StE> Yes of course – we will send the data from last week – there were about 1500 patients. Dr Bob now has all the information needed to explore the hunch that the A&E Department is being regularly mauled by a data mower … one that makes the A&E performance look better … on paper … and that obscures the actual problem. Just like treating a patient’s symptoms and making their underlying disease harder to diagnose and therefore harder to cure. The blog last week seems to have caused a bit of a stir … so this week we will continue on the same theme. I’m Dr Bob and I am a hospital doctor: I help to improve the health of poorly hospitals. And I do that using the Science of Improvement – which is the same as all sciences, there is a method to it. Over the next few weeks I will outline, in broad terms, how this is done in practice. And I will use the example of a hospital presenting with pain in their A&E department. We will call it St.Elsewhere’s ® Hospital … a fictional name for a real patient. It is a while since I learned science at school … so I thought a bit of a self-refresher would be in order … just to check that nothing fundamental has changed. This is what I found on page 2 of a current GCSE chemistry textbook. 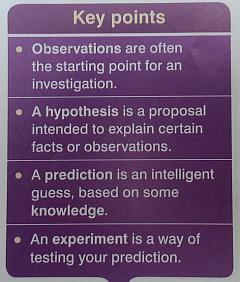 Note carefully that the process starts with observations; hypotheses come after that; then predictions and finally designing experiments to test them. The scientific process starts with study. Which is reassuring because when helping a poorly patient or a poorly hospital that is exactly where we start. So, first we need to know the symptoms; only then can we start to suggest some hypotheses for what might be causing those symptoms – a differential diagnosis; and then we look for more specific and objective symptoms and signs of those hypothetical causes. <Dr Bob> What is the presenting symptom? <Dr Bob> Are there any other associated symptoms? <Dr Bob> How long have these symptoms been present? <Dr Bob> Are the symptoms staying the same, getting worse or getting better? <Dr Bob> And what have you tried to relieve the pain? <Dr Bob> And how effective have these been? The pattern of symptoms is that of a chronic (longstanding) illness that has seasonal variation, which is getting worse over time and the usual remedies are not working. And it is obvious that we do not have a clear diagnosis; or know if our unclear diagnosis is incorrect; or know if we are actually dealing with an incurable disease. So first we need to focus on establishing the diagnosis. And Dr Bob is already drawing up a list of likely candidates … with carveoutosis at the top. <Dr Bob> Do you have any data on the 4-hour target pain? Do you measure it? <Dr Bob> Excellent, that will be useful as it should confirm that this is a chronic and worsening problem but it does not help establish a diagnosis. What we need is more recent, daily data. Just the last six months should be enough. Do you have that? This is where Dr Bob needs some diagnostic tools. He needs to see the pain scores presented as picture … so he can see the pattern over time … because it is a very effective way to generate plausible causal hypotheses. Dr Bob can do this on paper, or with an Excel spreadsheet, or use a tool specifically designed for the job. He selects his trusted visualisation tool : BaseLine©. 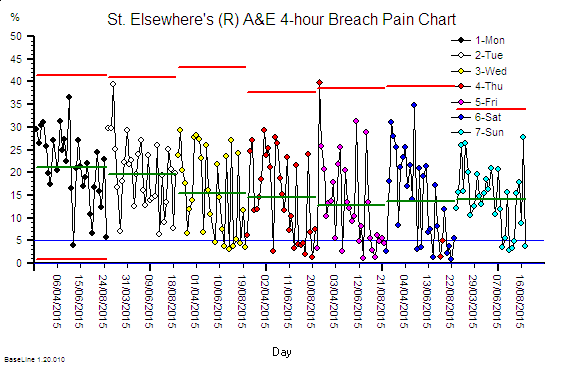 <Dr Bob> This is your A&E pain data plotted as a time-series chart. At first glance it looks very chaotic … that is shown by the wide and flat histogram. Is that how it feels? <StE> “That is exactly how it feels … earlier in the year it was unremitting pain and now we have a constant background ache with sharp, severe, unpredictable stabbing pains on top. I’m not sure what is worse! <Dr Bob> We will need to dig a bit deeper to find the root cause of this chronic pain … we need to identify the diagnosis or diagnoses … and your daily pain data should offer us some clues. So I have plotted your data in a different way … grouping by day of the week … and this shows there is a weekly pattern to your pain. It looks worse on Mondays and least bad on Fridays. Is that your experience? <StE> “Yes, the beginning of the week is definitely worse … because it is like a perfect storm … more people referred by their GPs on Mondays and the hospital is already full with the weekend backlog of delayed discharges so there are rarely beds to admit new patients into until late in the day. So they wait in A&E. Dr Bob’s differential diagnosis is firming up … he still suspects acute-on-chronic carveoutosis as the primary cause but he now has identified an additional complication … Forrester’s Syndrome. And Dr Bob suspects an unmentioned problem … that the patient has been traumatised by a blunt datamower! There is a big bun-fight kicking off on the topic of 7-day working in the NHS. The evidence is that there is a statistical association between mortality in hospital of emergency admissions and day of the week: and weekends are more dangerous. There are fewer staff working at weekends in hospitals than during the week … and delays and avoidable errors increase … so risk of harm increases. The evidence also shows that significantly fewer patients are discharged at weekends. So the ‘obvious’ solution is to have more staff on duty at weekends … which will cost more money. Simple, obvious, linear and wrong. Our intuition has tricked us … again! Let us unravel this Gordian Knot with a bit of flow science and a thought experiment. 1. 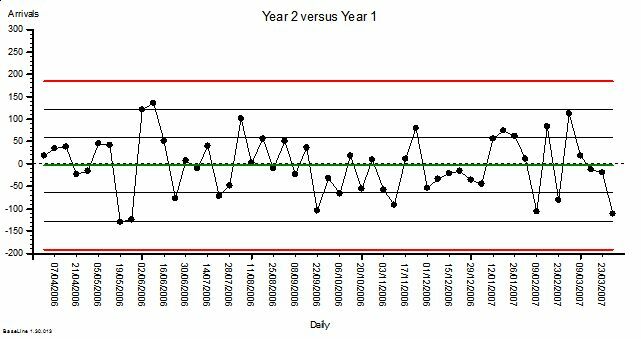 The evidence shows that there are fewer discharges at weekends … and so demonstrates lack of discharge flow-capacity. A discharge process is not a single step, there are many things that must flow in sync for a discharge to happen … and if any one of them is missing or delayed then the discharge does not happen or is delayed. The weakest link effect. 2. The evidence shows that the number of unplanned admissions varies rather less across the week; which makes sense because they are unplanned. 3. So add those two together and at weekends we see hospitals filling up with unplanned admissions – not because the sick ones are arriving faster – but because the well ones are leaving slower. 4. The effect of this is that at weekends the queue of people in beds gets bigger … and they need looking after … which requires people and time and money. 5. So the number of staffed beds in a hospital must be enough to hold the biggest queue – not the average or some fudged version of the average like a 95th percentile. 6. So a hospital running a 5-day model needs more beds because there will be more variation in bed use and we do not want to run out of beds and delay the admission of the newest and sickest patients. The ones at most risk. 7. People do not get sicker because there is better availability of healthcare services – but saying we need to add more unplanned care flow capacity at weekends implies that it does. What is actually required is that the same amount of flow-resource that is currently available Mon-Fri is spread out Mon-Sun. The flow-capacity is designed to match the customer demand – not the convenience of the supplier. And that means for all parts of the system required for unplanned patients to flow. What, where and when. It costs the same. 8. Then what happens is that the variation in the maximum size of the queue of patients in the hospital will fall and empty beds will appear – as if by magic. Empty beds that ensure there is always one for a new, sick, unplanned admission on any day of the week. 9. And empty beds that are never used … do not need to be staffed … so there is a quick way to reduce expensive agency staff costs. So with a comprehensive 7-day flow-capacity model the system actually gets safer, less chaotic, higher quality and less expensive. All at the same time. Safety-Flow-Quality-Productivity. It was the time for Bob and Leslie’s regular coaching session. Bob was already on line when Leslie dialed in to the teleconference. <Leslie> Hi Bob, sorry I am a bit late. <Bob> No problem Leslie. What aspect of improvement science shall we explore today? <Leslie> Well, I’ve been working through the Safety-Flow-Quality-Productivity cycle in my project and everything is going really well. The team are really starting to put the bits of the jigsaw together and can see how the synergy works. <Bob> Excellent. And I assume they can see the sources of antagonism too. <Leslie> Yes, indeed! I am now up to the point of considering productivity and I know it was introduced at the end of the Foundation course but only very briefly. <Bob> Yes, productivity was described as a system metric. A ratio of a steam metric and a stage metric … what we get out of the streams divided by what we put into the stages. That is a very generic definition. <Leslie> Yes, and that I think is my problem. It is too generic and I get it confused with concepts like efficiency. Are they the same thing? <Bob> A very good question and the short answer is “No”, but we need to explore that in more depth. Many people confuse efficiency and productivity and I believe that is because we learn the meaning of words from the context that we see them used in. If others use the words imprecisely then it generates discussion, antagonism and confusion and we are left with the impression of that it is a ‘difficult’ subject. The reality is that it is not difficult when we use the words in a valid way. <Leslie> OK. That reassures me a bit … so what is the definition of efficiency? <Bob> Efficiency is a stream metric – it is the ratio of the minimum cost of the resources required to complete one task divided by the actual cost of the resources used to complete one task. <Leslie> Um. OK … so how does time come into that? <Bob> Cost is a generic concept … it can refer to time, money and lots of other things. If we stick to time and money then we know that if we have to employ ‘people’ then time will cost money because people need money to buy essential stuff that the need for survival. Water, food, clothes, shelter and so on. <Leslie> So we could use efficiency in terms of resource-time required to complete a task? <Bob> Yes. That is a very useful way of looking at it. <Leslie> So how is productivity different? Completed tasks out divided by cash in to pay for resource time would be a productivity metric. It looks the same. <Bob> Does it? The definition of efficiency is possible cost divided by actual cost. It is not the as our definition of system productivity. <Leslie> Ah yes, I see. So do others define productivity the same way? “Productivity is an average measure of the efficiency of production. It can be expressed as the ratio of output to inputs used in the production process, i.e. output per unit of input”. “Efficiency is the (often measurable) ability to avoid wasting materials, energy, efforts, money, and time in doing something or in producing a desired result”. But that is closer to your definition of efficiency – the actual cost is the minimum cost plus the cost of waste. <Bob> Yes. I think you are starting to see where the confusion arises. And this is because there is a critical piece of the jigsaw missing. <Leslie> Oh …. and what is that? <Bob> Efficiency has nothing to do with whether the output of the stream has any worth. I can produce a worthless product with low waste … in other words very efficiently. And what if we have the situation where the output of my process is actually harmful. The more efficiently I use my resources the more harm I will cause from a fixed amount of resource … and in that situation it is actually safer to have an inefficient process! <Leslie> Wow! That really hits the nail on the head … and the implications are … profound. Efficiency is objective and relates only to flow … and between flow and productivity we have to cross the Safety-Quality line. Productivity also includes the subjective concept of worth or value. That all makes complete sense now. A productive system is a subjectively and objectively win-win-win design. <Bob> Yup. Get the safety, flow and quality perspectives of the design in synergy and productivity will sky-rocket. It is called a Fit-4-Purpose design. Posted in 6M Design, Bob&Les, Design, Flow, Productivity, Quality, Safety, SFQP | Comments Off on What is Productivity? It was the appointed time for the ISP coaching session and both Bob and Leslie were logged on and chatting about their Easter breaks. <Bob> OK Leslie, I suppose we had better do some actual work, which seems a shame on such a wonderful spring day. <Leslie> Yes, I suppose so. There is actually something I would like to ask you about because I came across it by accident and it looked very pertinent to flow design … but you have never mentioned it. <Bob> That sounds interesting. What is it? <Bob> Ah ha! You have stumbled across the Queue Theorists and the Factory Physicists. So, what was your take on it? <Leslie> Well it all sounded very impressive. The context is I was having a chat with a colleague who is also getting into the improvement stuff and who had been to a course called “Factory Physics for Managers” – and he came away buzzing about the VUT equation … and claimed that it explained everything! <Bob> OK. So what did you do next? <Leslie> I looked it up of course and I have to say the more I read the more confused I got. Maybe I am just a bid dim and not up to understanding this stuff. <Bob> Well you are certainly not dim so your confusion must be caused by something else. Did your colleague describe how the VUT equation is applied in practice? <Leslie> Um. No, I do not remember him describing an example – just that it explained why we cannot expect to run resources at 100% utilisation. <Bob> Well he is correct on that point … though there is a bit more to it than that. A more accurate statement is “We cannot expect our system to be stable if there is variation and we run flow-resources at 100% utilisation”. <Leslie> Well that sounds just like the sort of thing we have been talking about, what you call “resilient design”, so what is the problem with the VUT equation? <Bob> The problem is that it gives an estimate of the average waiting time in a very simple system called a G/G/1 system. <Leslie> Eh? What is a G/G/1 system? <Bob> Arrgh … this is the can of queue theory worms that I was hoping to avoid … but as you brought it up let us grasp the nettle. This is called Kendall’s Notation and it is a short cut notation for describing the system design. The first letter refers to the arrivals or demand and G means a general distribution of arrival times; the second G refers to the size of the jobs or the cycle time and again the distribution is general; and the last number refers to the number of parallel resources pulling from the queue. <Leslie> OK, so that is a single queue feeding into a single resource … the simplest possible flow system. <Bob> Yes. But that isn’t the problem. The problem is that the VUT equation gives an approximation to the average waiting time. It tells us nothing about the variation in the waiting time. <Leslie> Ah I see. So it tells us nothing about the variation in the size of the queue either … so does not help us plan the required space-capacity to hold the varying queue. <Bob> Precisely. There is another problem too. The ‘U’ term in the VUT equation refers to utilisation of the resource … denoted by the symbol ? or rho. The actual term is ? / (1-?) … so what happens when rho approaches one … or in practical terms the average utilisation of the resource approaches 100%? <Leslie> Um … 1 divided by (1-1) is 1 divided by zero which is … infinity! The average waiting time becomes infinitely long! <Bob> Yes, but only if we wait forever – in reality we cannot and anyway – reality is always changing … we live in a dynamic, ever-changing, unstable system called Reality. The VUT equation may be academically appealing but in practice it is almost useless. <Leslie> Ah ha! Now I see why you never mentioned it. So how do we design for resilience in practice? How do we get a handle on the behaviour of even the G/G/1 system over time? <Bob> We use an Excel spreadsheet to simulate our G/G/1 system and we find a fit-for-purpose design using an empirical, experimental approach. It is actually quite straightforward and does not require any Queue Theory or VUT equations … just a bit of basic Excel know-how. <Leslie> Phew! That sounds more up my street. I would like to see an example. <Bob> Welcome to the first exercise in ISP-2 (Flow). Posted in 6M Design, Bob&Les, Design, Flow, ISP, Operations, Resilience, Techniques, Theory, Tools | Comments Off on V.U.T. Bob and Leslie were already into the dialogue of their regular ISP coaching session when Bob saw an incoming text from one of his other ISPees. It was simply marked: “Very Urgent”. <Bob> Leslie, I have just received an urgent SMS that I think I need to investigate immediately. Could we put this conversation on ice for 10 minutes and I will call you back? <Leslie> Of course. I have lots to do. Please do not rush back if it requires more time. Ten minutes later Leslie saw that Bob was phoning and picked up. <Leslie> Hi Bob. I hope you were able to sort out the urgent problem. The fact that you are back suggests you did. <Bob> Hi Leslie. Thank you for your understanding and patience. The issue was urgent and the root cause is not yet solved, but lessons are being learned. And this is one you are going to come up against too so it may be an opportune time to explore it. <Leslie> H’mm. Now you have pricked my curiosity. But you can’t discuss someone else’s problem with me surely! <Bob> No indeed. Strict confidentiality is essential. We can talk about the generic issue though, without disclosing any details. Do you remember that project you were doing last year where you achieved an initial success and then it all seemed to go wobbly? <Leslie> Yes. At the time you said that I needed to put that one on the shelf and to press on with other projects. I think the phrase you used was “it needs to stew for a while“. <Leslie> The hard won improvement in performance slipped back and I felt like a failure and started to lose confidence. You said not to blame myself but to learn and move on. The lesson was I did not appreciate the difference between circles of control and circles of influence. I was trying to influence others before I had mastered self-control. <Bob> Yes. There was another factor too but I did not feel it was the time to explore it. Now feels like a better time. <Leslie> OK … now my curiosity is really fired up. <Bob> Do you remember last week’s blog about the Improvement Gearbox? <Leslie> Yes. I really liked the mechanical metaphor. It resonated with so many things. I have used it several times this week in conversations. <Bob> Well, there is a close relationship between the level of challenge and the gearbox. As complexity increases we need to be able to use more of the gears, and to change up and down with ease and according to need. <Leslie> Change down? I sort of assumed that once you got to fourth gear you stay there. <Bob> That is true if the terrain is level and everyone is on board the bus with the same destination in mind. In reality the terrain goes up and down and as we learn we need to stop and let some people get off and take others on board. <Leslie> So we need to change down gears on the uphill bits, change up gears on the downhill, and go through the whole gear sequence when we deliberately slow to a halt, and then get on our way again. <Bob> Yes. Well put. The world is changing all the time and the team on board is in dynamic flux. Some arrive, some leave and others stay on the bus but change seats as we move along. Not all seats suit all people. What is comfortable for one may be painful for another. <Leslie> So how come the urgent call? <Bob> A fight had broken out on their bus, the tribes were arguing because the improvements they have made have blown away some of the fog and exposed some deeper cultural cracks. Cracks that had been there all the time but were concealed by the fog of the daily chaos and the smoke of the burning martyrs. They had taken their eye off the road and were heading for a blind bend unaware of what was around the corner. <Bob> Yes, that about sums it up. A co-labor-ation call. <Leslie> Eh? Dis you just say collaboration in a weird way? <Bob> Yes. I chopped it up into concepts … “co” means together, “labor” means work and “ation” means action or process. If they do not learn to co-labor-ate then they will come off the road, crash, and burn. And join the graveyard of improvement train wrecks that litter the verges of the rocky road of change. <Bob> Whole gearbox stuff. All gears between first and fourth because they are all necessary at different times. Each gear builds on those which go before. There are no good or bad gears just fit-for-current-purpose or not. Bad driving is ineptitude. Not using the vehicle’s gearbox effectively and efficiently and risking the safety and comfort of the passengers and other road users. Poor leadership is analogous to poor driving. Dangerous. <Leslie> So an effective leader of change needs to be able to use all the gears competently and to know when to use which and when to change. And in doing so demonstrate what a safe pair of leadership hands looks like and what it can achieve … through collaborative effort. <Bob> Perfect! It is time for you to tear up your L plates. [Bing] Bob logged in for the weekly Webex coaching session. Leslie was not yet on line, but joined a few minutes later. <Leslie> Hi Bob, sorry I am a bit late, I have been grappling with a data analysis problem and did not notice the time. <Bob> Hi Leslie. Sounds interesting. Would you like to talk about that? <Leslie> Yes please! It has been driving me nuts! <Bob> OK. Some context first please. <Leslie> Right, yes. The context is an improvement-by-design assignment with a primary care team who are looking at ways to reduce the unplanned admissions for elderly patients by 10%. <Leslie> Because they said that would be an operationally very significant reduction. Most of their unplanned admissions, and therefore costs for admissions, are in that age group. They feel that some admissions are avoidable with better primary care support and a 10% reduction would make their investment of time and effort worthwhile. <Bob> OK. That makes complete sense. Setting a new design specification is OK. I assume they have some baseline flow data. <Leslie> Yes. We have historical weekly unplanned admissions data for two years. It looks stable, though rather variable on a week-by-week basis. <Bob> So has the design change been made? <Leslie> Yes, over three months ago – so I expected to be able to see something by now but there are no red flags on the XmR chart of weekly admissions. No change. They are adamant that they are making a difference, particularly in reducing re-admissions. I do not want to disappoint them by saying that all their hard work has made no difference! <Bob> OK Leslie. Let us approach this rationally. 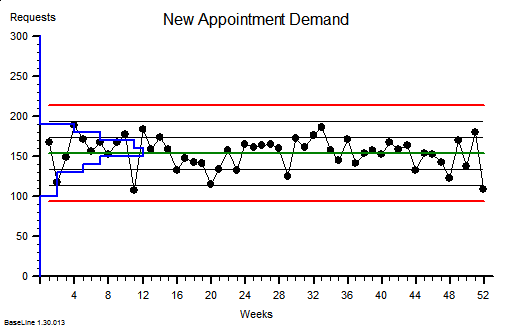 What are the possible causes that the weekly admissions chart is not signalling a change? <Leslie> If there has not been a change in admissions. This could be because they have indeed reduced readmissions but new admissions have gone up and is masking the effect. <Bob> Yes. That is possible. Any other ideas? <Leslie> That their intervention has made no difference to re-admissions and their data is erroneous … or worse still … fabricated! <Bob> Yes. That is possible too. Any other ideas? <Leslie> Um. No. I cannot think of any. <Bob> What about the idea that the XmR chart is not showing a change that is actually there? <Leslie> You mean a false negative? That the sensitivity of the XmR chart is limited? How can that be? I thought these charts will always signal a significant shift. <Bob> It depends on the degree of shift and the amount of variation. The more variation there is the harder it is to detect a small shift. In a conventional statistical test we would just use bigger samples, but that does not work with an XmR chart because the run tests are all fixed length. Pre-defined sample sizes. <Leslie> So that means we can miss small but significant changes and come to the wrong conclusion that our change has had no effect! Isn’t that called a Type 2 error? <Bob> Yes, it is. 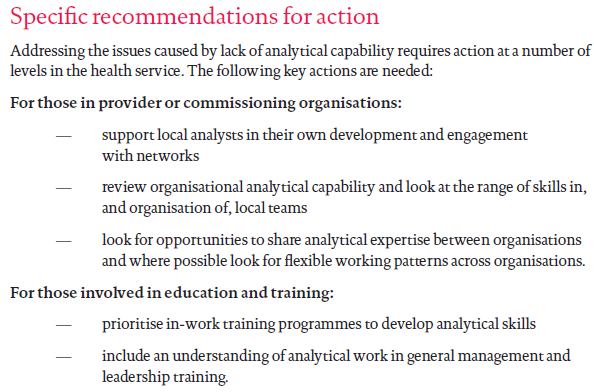 And we need to be aware of the limitations of the analysis tool we are using. So, now you know that how might you get around the problem? <Leslie> One way would be to aggregate the data over a longer time period before plotting on the chart … we know that will reduce the sample variation. <Bob> Yes. That would work … but what is the downside? <Leslie> That we have to wait a lot longer to show a change, or not. We do not want that. <Bob> I agree. So what we do is we use a chart that is much more sensitive to small shifts of the mean. And that is called a cusum chart. These were not invented until 30 years after Shewhart first described his time-series chart. To give you an example, do you recall that the work-in-progress chart is much more sensitive to changes in flow than either demand or activity charts? <Leslie> Yes, and the WIP chart also reacts immediately if either demand or activity change. It is the one I always look at first. <Bob> That is because a WIP chart is actually a cusum chart. It is the cumulative sum of the difference between demand and activity. <Leslie> OK! That makes sense. So how do I create and use a cusum chart? <Bob> I have just emailed you some instructions and a few examples. You can try with your unplanned admissions data. It should only take a few minutes. I will get a cup of tea and a chocolate Hobnob while I wait. <Leslie> Wow! That is just brilliant! I can see clearly on the cusum chart when the shifts happened and when I split the XmR chart at those points the underlying changes become clear and measurable. The team did indeed achieve a 10% reduction in admissions just as they claimed they had. And I checked with a statistical test which confirmed that it is statistically significant. <Bob> Good work. Cusum charts take a bit of getting used to and we have be careful about the metric we are plotting and a few other things but it is a useful trick to have up our sleeves for situations like this. <Leslie> Thanks Bob. I will bear that in mind. Now I just need to work out how to explain cusum charts to others! I do not want to be accused of using statistical smoke-and-mirrors! I think a golf metaphor may work with the GPs. [Beep Beep] Bob’s phone reminded him that it was time for the remote coaching session with Leslie, one of the CHIPs (community of healthcare improvement science practitioners). He flipped open his laptop and logged in. Leslie was already there. <Leslie> Hi Bob. I hope you had a good Xmas. <Bob> Thank you Leslie. Yes, I did. I was about to ask the same question. <Leslie> Not so good here I am afraid to say. The whole urgent care system is in meltdown. The hospital is gridlocked, the 4-hour target performance has crashed like the Stock Market on Black Wednesday, emergency admissions have spilled over into the Day Surgery Unit, hundreds of operations have been cancelled, waiting lists are spiralling upwards and the fragile 18-week performance ceiling has been smashed. It is chaos. Dangerous chaos. <Bob> Oh dear. It sounds as if the butterfly has flapped its wings. Do you remember seeing this pattern of behaviour before? <Leslie> Sadly yes. When I saw you demonstrate the Save the NHS Game. This is exactly the chaos I created when I attempted to solve the 4-hour target problem, and the chaos I have seen every doctor, manager and executive create when they do too. We seem to be the root cause! <Bob> Please do not be too hard on yourself Leslie. I am no different. I had to realise that I was contributing to the chaos I was complaining about, by complaining about it. Paradoxically not complaining about it made no difference. My error was one of omission. I was not learning. I was stuck in a self-justifying delusional blame-bubble of my own making. My humility and curiosity disabled by my disappointment, frustration and anxiety. My inner chimp was running the show! <Leslie> Wow! That is just how everyone is feeling and behaving. Including me. So how did you escape from the blame-bubble? <Bob> Well first of all I haven’t completely escaped. I just spend less time there. It is always possible to get sucked back in. The way out started to appear when I installed a “learning loop”. <Leslie> A what? Is that like a hearing loop for the partially deaf? <Bob> Ha! Yes! A very apt metaphor. Yes, just like that. Very good. I will borrow that if I may. <Leslie> So what did your learning loop consist of? <Bob> A journal. I started a journal. I invested a few minutes each day reflecting and writing it down. The first entries were short and rather “ranty”. I cannot possibly share them in public. It is too embarrassing. But it was therapeutic and over time the anger subsided and a quieter, calmer inner voice could be heard. The voice of curiosity. It was asking one question over and over again. “How?” … not “Why?”. <Leslie> And what happened next? <Bob> I started to take more notice of things that I had discounted before. Apparently insignificant things that I discovered had profound implications. Like the “butterflies wing” effect … I discovered that small changes can have big effects. I also learned to tune in to specific feelings because they were my warning signals. <Bob> Yes. Niggles are flashes of negative emotion that signal a design flaw. They are usually followed by an untested assumption, an invalid conclusion, an unwise decision and a counter-productive action. It all happens unconsciously and very fast so we are only aware of the final action – the MR ANGRY reply to the email that we stupidly broadcast via the Reply All button! <Leslie> So you learned to tune into the niggle to avoid the chain reaction that led to hitting the Red Button. <Bob> Sort of. What actually happened is that the passion unleashed by the niggle got redirected into a more constructive channel – via my Curiosity Centre to power up the Improvement Engine. It was a bit rusty! It had not been used for a long while. <Leslie> And once the “engine” was running it sucked in niggles that were now a source of fuel! You started harvesting them using the 4N Chart! So what was the output? <Bob> Purposeful, focused, constructive, rational actions. Not random, destructive, emotional explosions. <Leslie> Constructive actions such as? <Bob> Well designing and building the FISH course is one, and this ISP programme is another. <Leslie> OK. So I can see that a private journal can help an individual to build their own learning loop. How does that work with groups? We do not all need to design and build a FISH-equivalent surely! <Bob> No indeed. What we do is we share stories. We gather together in small groups around camp fires and we share what we are learning … as we are learning it. We contribute our perspective to the collective awareness … and we all gain from everyone’s learning. We learn and teach together. <Leslie> So the stories are about what we are learning, not what we achieved with that learning. <Bob> Well put! The “how” we achieved it is more valuable knowledge than “what” we achieved. The “how” is the process, the “what” is just the product. And the “how” we failed to achieve is even more valuable. <Leslie> Wow! So are you saying that the chaos we are experiencing is the expected effect of not installing enough learning loops! A system-wide error of omission. <Bob> I would say that is a reasonable diagnosis. <Leslie> So a rational and reasonable course of treatment becomes clear. I am on the case! [Bing Bong] Bob was already logged into the weekly coaching Webex when Leslie arrived: a little late. <Bob> Hi Leslie, how has your week been? <Leslie> Hi Bob, sorry I am a bit late. It has been a very interesting week. <Bob> My curiosity is pricked … are you willing to share? <Leslie> Yes indeed! First an update on the improvement project was talked about a few weeks ago. <Bob> The call centre one? <Leslie> Yes. The good news is that the improvement has been sustained. It was not a flash in the pan. The chaos is gone and the calm has continued. <Bob> That is very good to hear. And how did the team react? <Leslie> That is one of the interesting things. They went really quiet. There was no celebration, no cheering, no sounds of champagne corks popping. It was almost as if they did not believe what they were seeing and they feared that if they celebrated too early they would somehow trigger a failure … or wake up from a dream. <Bob> That is a very common reaction. It takes a while for reality to sink in – the reality that they have changed something, that the world did not end, and that their chronic chaos has evaporated. It is like a grief reaction … they have to mourn the loss of their disbelief. That takes time. About six weeks usually. <Bob> Well done Leslie! You have helped them break through the “Impossibility Barrier”. So what was your answer? <Bob> OK. And how was that reply received? <Bob> Well they are factually correct. <Leslie> Yes I know, so I pointed out that although the technical part of the design does not take very long … that was not the problem … what slowed us down was the cultural part of the change. And that is done now so does not need to be repeated. The next study-plan-do cycle will be much quicker and they only need me for the technical bits they have not seen before. <Bob> Excellent. So how would you now describe your role? <Leslie> More of a facilitator and coach with a bit of only-when-needed training thrown in. <Bob> Exactly … and I have a label for this role … I call it a Catalyst. <Leslie> That is interesting, why so? <Bob> Because the definition of a catalyst fits rather well. Using the usual scientific definition, a catalyst increases the yield and rate of a chemical reaction. With a catalyst, reactions occur faster and with less energy and catalysts are not consumed, they are recycled, so only tiny amounts are required. <Leslie> Ah yes, that feels about right. But I am not just catalysing the reaction that produced the desired result am I? <Bob> No. What else are you doing? <Leslie> I am also converting some of the substrate into potential future catalysts too. <Bob> Yes, you are. And that is what is needed for the current paradigm to shift. <Leslie> Wow! I see that. This is powerful stuff! <Bob> It is indeed. And the reaction you are catalysing is the combination of wisdom with ineptitude. <Leslie> Eh? Can you repeat that again. Wisdom and ineptitude? Those are not words that I hear very often. I hear words like dumb, stupid, ignorant, incompetent and incapable. What is the reason you use those words? <Bob> Simply because the dictionary definitions fit. Ineptitude means not knowing what to do to get the result we want, which is not the same as just not knowing stuff or not having the necessary skills. What we need are decisions which lead to effective actions and to intended outcomes. Wise decisions. If we demonstrate ineptitude we reveal that we lack the wisdom to make those effective decisions. So we need to combine ineptitude with wisdom to get the capability to achieve our purpose. <Leslie> But why use the word “wisdom”? Why not just “knowledge”? <Bob> Because knowledge is not enough. Knowledge just implies that I recognise what I am seeing. “I know this. I have seen it before“. Appreciating the implication of what I recognise is something more … it is called “understanding”. <Leslie> Ah! I know this. I have seen this before. I know what a time-series chart is and I know how to create one but it takes guidance, time and practice to understand the implications of what the chart is saying about the system. But where does wisdom fit? <Bob>Understanding is past-focussed. We understand how we got to where we are in the present. We cannot change the past so understanding has nothing to do with wise decisions or effective actions or intended outcomes. It is retrospection. <Leslie> So wisdom is future-focussed. It is prospective. It is the ability to predict the outcome of an action and that ability is necessary to make wise decisions. That is why wisdom is the antidote to ineptitude! <Bob> Well put! And that is what you did long before you made the change in the call centre … you learned how to make reliable predictions … and the results have confirmed yours was a wise decision. They got their intended outcome. You are not inept. <Leslie> Ah! Now I understand the difference. I am a catalyst for improvement because I am able to diagnose and treat ineptitude. That is what you did for me. You are a catalyst. <Bob> Welcome to the world of the Improvement Science Practitioner. You have earned your place. 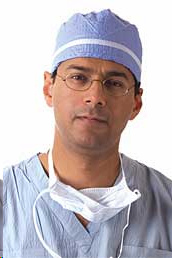 The word “ineptitude” is coined by Dr Atul Gawande in the first of the 2014 Reith Lectures entitled “Why Do Doctors Fail?“. Click HERE to listen to his first lecture (30 minutes). In his second lecture he describes how it is the design of the system that delivers apparently miraculous outcomes. It is the way that the parts work together and the attention to context and to detail that counts. Click HERE to hear his second lecture “The Century of the System” (30 minutes). And Atul has a proven track record in system improvement … he is the doctor-surgeon-instigator of the WHO Safer Surgery Check List – a simple idea borrowed from aviation that is now used worldwide and is preventing 1000’s of easily avoidable deaths during and after surgery. Click HERE to hear his third lecture “The Problem of Hubris” (30 minutes). Click HERE to hear his fourth lecture “The Idea of Wellbeing” (30 minutes). The Webex icon bounced up and down on Bob’s task bar signalling that Leslie had just joined the weekly ISP coaching session. <Leslie> Hi Bob. I have been so busy this week that I have not had time to consider a topic to explore. <Bob> No problem Leslie, I have shelf full of topics we have not touched yet. So shall we talk about counter-productivity? <Leslie> Don’t you mean productivity … the fourth dimension of system improvement. <Bob>They are related of course but we will approach the issue of productivity from a different angle. Rather like we did with safety. To improve safety we considered at the causes of un-safety and focussed our efforts there. <Leslie> Ah yes, I see. So to improve productivity we look at the causes of un-productivity … in other words counter-productive beliefs and behaviours that are manifest as system design flaws. <Bob> Exactly. So remind me what the definition of a productivity metric is from your FISH course. <Leslie> Productivity is the ratio of a stream metric and a stage metric. Value-for-Money for example. <Bob> Good. So counter-productivity is also a ratio of a stream and a stage metric. <Leslie> Um, I’m not sure I quite get that. Can you explain a bit more. <Bob> OK. To explore deeper we need to be clear about how each metric relates to our intended outcome. Remember in safety-by-design we count the number and severity of risks and harm because as harm is going up then safety is going down. So harm is an un-safety stream metric. <Leslie> Ah! Yes I see. So if we look at cycle-time, which is a stage metric; as cycle-time increases, the activity falls and productivity falls. So cycle-time is actually a counter-productivity metric. <Bob>Excellent. You are getting the hang of the concept of counter-productivity. <Leslie> And we need to be careful because productivity is a ratio so the numerator and denominator metrics work in opposite ways: increasing the magnitude of the numerator is equivalent to decreasing the magnitude of the denominator – the ratio increases. <Bob> Indeed, there are many hazards with ratios as we have explored before. So let is consider a real and rather useful example. Let us look at Little’s Law from the perspective of counter-productivity. Remind me of the definition of Little’s Law for a single step system. <Leslie> Little’s Law is a mathematically proven law of flow physics which states that the average lead-time is the product of the average work-in-progress and the average cycle-time. <Bob> Good and I am pleased to see that you have used cycle-time. We are considering a single stream, single stage, single step system. <Leslie> Yes, I avoided using the unqualified term ‘activity’. I have learned that lesson the hard way too! <Bob> So how do the terms in Little’s Law relate to streams, stages and systems? <Leslie> Lead-time is a stream metric, cycle-time is a stage metric and work-in-progress is a …. h’mm. What it is? A stream metric or a stage metric? <Leslie>A system metric? WIP is a system metric! <Bob> Good. So now re-arrange Little’s Law as a productivity formula. <Bob> So is WIP a productivity or a counter-productivity metric? <Leslie> H’mmm …. I will need to work this through logically and step-by-step. I do not trust my intuition on this flow stuff. Increasing cycle-time is counter-productive because it implies activity is falling while costs are not. But cycle-time is on the bottom of the ratio so it’s effect reverses. So if lead-time stays the same and cycle-time increases then because it is on the bottom of the ratio that implies a more productive design. And at the same time work in progress must be falling. Urrgh! This is hurting my head. <Bob> Good, keep going … you are nearly there. <Leslie> So a falling WIP is a sign of increasing productivity. <Bob> Good … and that implies? <Leslie> WIP is a counter-productivity system metric! <Bob> Well done. Your logic is flawless. <Leslie> So that is why we focus on WIP so much! Whatever causes WIP to increase is counter-productive! Ahhhh …. that makes complete sense. Lo-WIP designs are more productive than Hi-WIP designs. <Bob> Bravo! And translating this into financial metrics … it is because a big queue of waiting work incurs costs. Storage cost, maintenance cost, processing cost and so on. So WIP is a liability. It is not an asset! <Leslie> But doesn’t that imply treating work-in-progress as an asset on the financial balance sheet is counter-productive? <Leslie> Oh dear! That revelation is going to upset a lot of people in the accounting department! <Bob> The painful reality is that the Laws of Flow Physics are completely indifferent to what any of us believe or do not believe. <Leslie> Wow! I like this concept of counter-productivity … it really helps to expose some of our invalid assumptions that invisibly block improvement! <Bob> So here is a question to ponder. Is zero WIP desirable or even possible? <Leslie> H’mmm. I will have to think about that. I know you would not have asked the question for no reason. [Beep] It was time again for the weekly Webex coaching session. Bob dialled into the teleconference to find Leslie already there … and very excited. <Leslie> Hi Bob, I am so excited. I cannot wait to tell you about what has happened this week. <Bob> Hi Leslie. You really do sound excited. I cannot wait to hear. <Leslie> Well, let us go back a bit in the story. You remember that I was really struggling to convince the teams I am working with to actually make changes. I kept getting the ‘Yes … but‘ reaction from the sceptics. It was as if they were more comfortable with complaining. <Bob> That is the normal situation. We are all very able to delude ourselves that what we have is all we can expect. <Leslie> Well, I listened to what you said and I asked them to work through what they predicted could happen if they did nothing. Their healthy scepticism then worked to build their conviction that doing nothing was a very dangerous choice. <Bob> OK. And I am guessing that insight was not enough. <Leslie> Correct. So then I shared some examples of what others had achieved and how they had done it, and I started to see some curiosity building, but no engagement still. So I kept going, sharing stories of ‘what’, and ‘how’. And eventually I got an email saying “We have thought about what you said about a one day experiment and we are prepared to give that a try“. <Bob> Excellent. How long ago was that? <Leslie> Three months. And I confess that I was part of the delay. I was so surprised that they said ‘OK‘ that I was not ready to follow on. <Bob> OK. It sounds like you did not really believe it was possible either. So what did you do next? <Leslie> Well I knew for sure that we would only get one chance. If the experiment failed then it would be Game Over. So I needed to know before the change what the effect would be. I needed to be able to predict it accurately. I also needed to feel reassured enough to take the leap of faith. <Bob> Very good, so did you use some of your ISP-2 skills? <Leslie> Yes! And it was a bit of a struggle because doing it in theory is one thing; doing it in reality is a lot messier. <Bob> So what did you focus on? <Leslie> The top niggle of course! At St Elsewhere® we have a call-centre that provides out-of-office-hours telephone advice and guidance – and it is especially busy at weekends. We are required to answer all calls quickly, which we do, and then we categorise them into ‘urgent’ and ‘non-urgent’ and pass them on to the specialists. They call the clients back and provide expert advice and guidance for their specific problem. <Bob>So you do not use standard scripts? <Leslie> No, that does not work. The variety of the problems we have to solve is too wide. And the specialist has to come to a decision quite quickly … solve the problem over the phone, arrange a visit to an out of hours clinic, or to dispatch a mobile specialist to the client immediately. <Bob> OK. So what was the top niggle? <Leslie> We have contractual performance specifications we have to meet for the maximum waiting time for our specialists to call clients back; and we were not meeting them. That implied that we were at risk of losing the contract and that meant loss of revenue and jobs. <Bob> So doing nothing was not an option. <Leslie> Correct. And asking for more resources was not either … the contract was a fixed price one. We got it because we offered the lowest price. If we employed more staff we would go out of business. It was a rock-and-a-hard-place problem. <Bob> OK. So if this was ranked as your top niggle then you must have had a solution in mind. <Leslie> I had a diagnosis. The Vitals Chart© showed that we already had enough resources to do the work. The performance failure was caused by a scheduling policy – one that we created – our intuitively-obvious policy. <Bob> Ah ha! So you suggested doing something that felt counter-intuitive. <Leslie> Yes. And that generated all the ‘Yes .. but‘ discussion. <Bob> OK. Do you have the Vitals Chart© to hand? Can you send me the Wait-Time run chart? <Leslie> Yes, I expected you would ask for that … here it is. <Bob> OK. 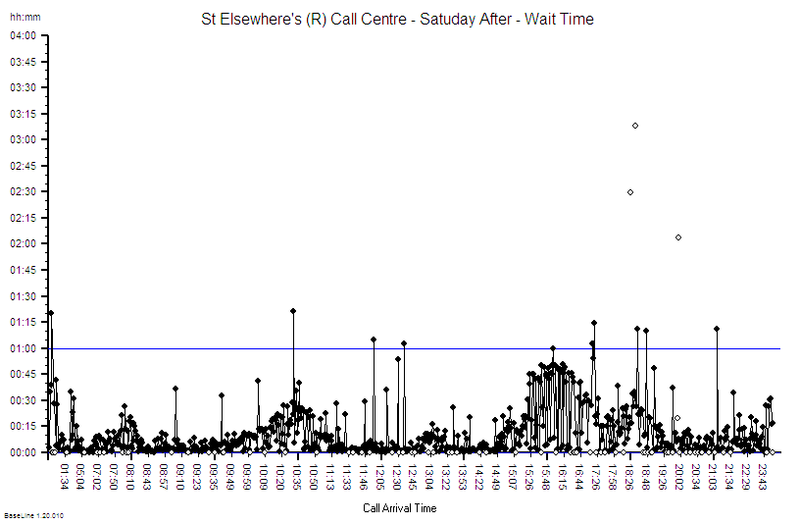 So I am looking at the run chart of waiting time for the call backs for one Saturday, and it is in call arrival order, and the blue line is the maximum allowed waiting time is that correct? <Leslie>Yup. Can you see the diagnosis? <Bob> Yes. This chart shows the classic pattern of ‘prioritycarveoutosis’. The upper border is the ‘non-urgents’ and the lower group are the ‘urgents’ … the queue jumpers. <Bob> And the WIP chart did not support that assertion. <Leslie> Correct. It showed we had enough total flow-capacity already. <Bob> So you suggested a change in the scheduling policy would solve the problem without costing any money. <Leslie> Yes. And the reaction to that was ‘That is impossible. We are already working flat out. We need more capacity because to work quicker will mean cutting corners and it is unsafe to cut-corners‘. <Bob> So how did you get around that invalid but widely held belief? <Leslie> I used one of the FISH techniques. I got a few of them to play a table top game where we simulated a much simpler process and demonstrated the same waiting time pattern on a hand-drawn run chart. <Bob> Excellent. Did that get you to the ‘OK, we will give it a go for one day‘ decision. <Leslie>Yes. But then I had to come up with a new design and I had test it so I know it would work. <Bob> Because that was a step too far for them. And It sounds like you achieved that. <Leslie> Yes. It was tough though because I knew I had to prove to myself I could do it. If I had asked you I know what you would have said – ‘I know you can do this‘. And last Saturday we ran the ‘experiment’. I was pacing up and down like an expectant parent! <Bob> I expect rather like the ESA team who have just landed Rosetta’s little probe-child on an asteroid travelling at 38,000 miles per hour, billions of miles from Earth after a 10 year journey through deep space! Totally inspiring stuff! <Leslie> Yes. And that is why I am so excited because OUR DESIGN WORKED! Exactly as predicted. <Bob> Three cheers for you! You have experienced that wonderful feeling when you see the effect of improvement-by-design with your own eyes. When that happens then you really believe what opportunities become possible. <Bob> Wow! That is a spectacular result! The activity looks very similar, and other than a ‘blip’ between 15:00 and 19:00 the prioritycarveoutosis has gone. The spikes have assignable causes I assume? <Leslie> Spot on again! The activity was actually well above average for a Saturday. The subjective feedback was that the new design felt calm and under-control. The chaos had evaporated. The performance was easily achieved and everyone was very positive about the whole experience. The sceptics were generous enough to say it had gone better than they expected. And yes, I am now working through the ‘spikes’ and excluding them … but only once I have a root cause that explains them. <Bob> Well done Leslie! I sense that you now believe what is possible whereas before you just hoped it would be. <Leslie> Yes! And the most important thing to me is that we did it ourselves. Which means improvement-by-design can be learned. It is not obvious, it feels counter-intuitive, so it is not easy … but it works. <Bob> Yes. That is the most important message. And you have now earned your ISP Certificate of Competency. [Beeeeeep] It was time for the weekly coaching Webex. Bob, a seasoned practitioner of flow science, dialled into the teleconference with Lesley. <Bob> Good afternoon Lesley, can I suggest a topic today? <Lesley> Hi Bob. That would be great … and I am sure you have a good reason for suggesting it. <Bob> I would like to explore the concept of time-traps again because it something that many find confusing. Which is a shame because it is often the key to delivering surprisingly dramatic and rapid improvements at no cost. <Lesley> Well doing exactly that is what everyone seems to be clamouring for so it sounds like a good topic to me. I confess that I am still not confident to teach others about time-traps. <Bob> OK. Let us start there. Can you describe what happens when you try to teach it? <Lesley> Well, it seems to be when I say that the essence of a time-trap is that the lead time and the flow are independent … for example the lead time stays the same even though the flow is changing. That really seems to confuse people … and me too if I am brutally honest. <Bob> OK. Can you share the example that you use? <Lesley> Well it depends on who I am talking to. I prefer to use an example that they are familiar with. If it is a doctor I might use the example of the ward round. If it is a manager I might use the example of emails or meetings. <Bob> Assume I am a doctor then – an urgent care physician. <Lesley> OK. Let us take it that I have done the 4N Chart® and the top niggle is ‘Frustration because the post-take ward round takes so long that it delays the discharge of patients who then often have to stay an extra night which then fills up the unit with waiting patients and we get blamed for blocking flow from A&E and causing A&E breaches‘. <Bob> That sounds like a good example. What is the time-trap in that design? <Lesley> The post-take ward round. <Bob> And what justification is usually offered for using that design? <Lesley> That it is a more efficient use of the expensive doctor’s time if the whole team congregate once a day and work through all the patients admitted over the previous 24 hours. They review the presentation, results of tests, diagnosis, management plans, response to treatment, decide the next steps and do the paperwork. <Bob> And why is that a time-trap design? <Lesley> Because it does not matter if one patient is admitted or ten … the average lead time from the perspective of the patient is the same – about one day. <Bob> Correct. So why is the doctor complaining that there are always lots of patients to see? <Lesley> Because there are. The emergency short stay ward is usually full by the time the post take ward round happens. <Bob> And how do you present the data that shows the lead time is independent of the flow? <Lesley> I use a Gantt chart, but the problem I find is that there is so much variation and queue jumping it is not blindingly obvious from the Gantt chart that there is a time-trap. There is so much else clouding the picture. <Bob>Is that where the ‘but I do not understand‘ conversation starts? <Lesley> Yes. And that is where I get stuck too. <Bob> OK. The issue here is that a Gantt chart is not the ideal visualisation tool when there are lots of crossed-streams, frequently changing priorities, and many other sources of variation. The Gantt chart gets ‘messy’. The trick here is to use a Vitals Chart – and you can derive that from the same data you used for the Gantt chart. <Bob> Yes, I have experienced that too. I think what happens is that those who do the foundation training and discover the Gantt chart then try to use it to solve every flow problem – and in their enthusiasm they discount any warning advice. Desperation drives over-inflated expectation which is often the pre-cursor to disappointment, and then disillusionment. The Nerve Curve again. <Lesley> But a Vitals Chart is an ISP level technique and you said that we do not need to put everyone through ISP training. <Bob>That is correct. I am advocating an ISP-in-training using a Vitals Chart to explain the concept of a time-trap so that everyone understands it well enough to see the flaw in the design. <Lesely> Ah ha! Yes, I see. So what is my next step? <Bob> I will let you answer that. <Lesley> Um, let me think. The outcome I want is everyone understands the concept of a time-trap well enough to feel comfortable with trying a different no-trap design because they can see the benefits for them. And to get that depth of understanding I need to design a table top exercise that starts with a time-trap design and generates raw data that we can use to build both a Gantt chart and the Vitals Chart; so I can point out and explain the characteristic finger-print of a time trap. And then we ‘test’ an alternative time-trap-free design and generate the prognostic Gantt and Vitals Charts and compare with the baseline diagnostic charts to reveal the improvement. <Bob> That sounds like a good plan to me. And if you do that, and your team apply it to a real improvement exercise, and you see the improvement and you share the story … then that will earn you a coveted ISP Certificate of Competency. <Lesley>Ah ha! Now I understand the reason you suggested this topic! I am on the case! [Bing bong]. The sound heralded Lesley logging on to the weekly Webex coaching session with Bob, an experienced Improvement Science Practitioner. <Bob> Good afternoon Lesley. How has your week been and what topic shall we explore today? <Lesley> Hi Bob. Well in a nutshell, the bit of the system that I have control over feels like a fragile oasis of calm in a perpetual desert of chaos. It is hard work keeping the oasis clear of the toxic sand that blows in! <Bob> A compelling metaphor. I can just picture it. Maintaining order amidst chaos requires energy. So what would you like to talk about? <Lesley> Well, I have a small shoal of FISHees who I am guiding through the foundation shallows and they are getting stuck on Little’s Law. I confess I am not very good at explaining it and that suggests to me that I do not really understand it well enough either. <Bob> OK. So shall we link those two theme – chaos and Little’s Law? <Lesley> That sounds like an excellent plan! <Bob> OK. So let us refresh the foundation knowledge. What is Little’s Law? <Lesley>It is a fundamental Law of process physics that relates flow, with lead time and work in progress. <Lesley> Average lead time is equal to the average flow multiplied by the average work in progress. <Bob>Yes. And what are the units of flow in your equation? <Lesley> Ah yes! That is a trap for the unwary. We need to be clear how we express flow. The usual way is to state it as number of tasks in a defined period of time, such as patients admitted per day. In Little’s Law the convention is to use the inverse of that which is the average interval between consecutive flow events. This is an unfamiliar way to present flow to most people. <Bob> Good. And what is the reason that we use the ‘interval between events’ form? <Leslie> Because it is easier to compare it with two critically important flow metrics … the takt time and the cycle time. <Bob> And what is the takt time? <Leslie> It is the average interval between new tasks arriving … the average demand interval. <Bob> And the cycle time? <Leslie> It is the shortest average interval between tasks departing …. and is determined by the design of the flow constraint step. <Bob> Excellent. And what is the essence of a stable flow design? <Lesley> That the cycle time is less than the takt time. <Bob>Why less than? Why not equal to? <Leslie> Because all realistic systems need some flow resilience to exhibit stable and predictable-within-limits behaviour. <Bob> Excellent. Now describe the design requirements for creating chronically chaotic system behaviour? <Leslie> This is a bit trickier to explain. The essence is that for chronically chaotic behaviour to happen then there must be two feedback loops – a destabilising loop and a stabilising loop. The destabilising loop creates the chaos, the stabilising loop ensures it is chronic. <Bob> Good … so can you give me an example of a destabilising feedback loop? <Leslie> A common one that I see is when there is a long delay between detecting a safety risk and the diagnosis, decision and corrective action. The risks are often transitory so if the corrective action arrives long after the root cause has gone away then it can actually destabilise the process and paradoxically increase the risk of harm. <Bob> Can you give me an example? <Leslie>Yes. Suppose a safety risk is exposed by a near miss. A delay in communicating the niggle and a root cause analysis means that the specific combination of factors that led to the near miss has gone. The holes in the Swiss cheese are not static … they move about in the chaos. So the action that follows the accumulation of many undiagnosed near misses is usually the non-specific mantra of adding yet another safety-check to the already burgeoning check-list. The longer check-list takes more time to do, and is often repeated many times, so the whole flow slows down, queues grow bigger, waiting times get longer and as pressure comes from the delivery targets corners start being cut, and new near misses start to occur; on top of the other ones. So more checks are added and so on. <Bob> An excellent example! And what is the outcome? <Leslie> Chronic chaos which is more dangerous, more disordered and more expensive. Lose lose lose. <Bob> And how do the people feel who work in the system? <Leslie> Chronically naffed off! Angry. Demotivated. Cynical. <Bob>And those feelings are the key symptoms. Niggles are not only symptoms of poor process design, they are also symptoms of a much deeper problem: a violation of values. <Leslie> I get the first bit about poor design; but what is that second bit about values? <Bob> We all have a set of values that we learned when we were very young and that have bee shaped by life experience. They are our source of emotional energy, and our guiding lights in an uncertain world. Our internal unconscious check-list. So when one of our values is violated we know because we feel angry. How that anger is directed varies from person to person … some internalise it and some externalise it. <Leslie> OK. That explains the commonest emotion that people report when they feel a niggle … frustration which is the same as anger. <Bob>Yes. And we reveal our values by uncovering the specific root causes of our niggles. For example if I value ‘Hard Work’ then I will be niggled by laziness. If you value ‘Experimentation’ then you may be niggled by ‘Rigid Rules’. If someone else values ‘Safety’ then they may value ‘Rigid Rules’ and be niggled by ‘Innovation’ which they interpret as risky. <Leslie> Ahhhh! Yes, I see. This explains why there is so much impassioned discussion when we do a 4N Chart! But if this behaviour is so innate then it must be impossible to resolve! <Bob> Understanding how our values motivate us actually helps a lot because we are naturally attracted to others who share the same values – because we have learned that it reduces conflict and stress and improves our chance of survival. We are tribal and tribes share the same values. <Leslie> Is that why different departments appear to have different cultures and behaviours and why they fight each other? <Bob> It is one factor in the Silo Wars that are a characteristic of some large organisations. But Silo Wars are not inevitable. <Leslie> So how are they avoided? <Bob> By everyone knowing what common purpose of the organisation is and by being clear about what values are aligned with that purpose. <Leslie> So in the healthcare context one purpose is avoidance of harm … primum non nocere … so ‘safety’ is a core value. Which implies anything that is felt to be unsafe generates niggles and well-intended but potentially self-destructive negative behaviour. <Bob> Indeed so, as you described very well. <Leslie> So how does all this link to Little’s Law? <Bob>Let us go back to the foundation knowledge. What are the four interdependent dimensions of system improvement? <Leslie> Safety, Flow, Quality and Productivity. <Bob> And one measure of productivity is profit. So organisations that have only short term profit as their primary goal are at risk of making poor long term safety, flow and quality decisions. <Leslie> And flow is the key dimension – because profit is just the difference between two cash flows: income and expenses. <Bob> Exactly. One way or another it all comes down to flow … and Little’s Law is a fundamental Law of flow physics. So if you want all the other outcomes … without the emotionally painful disorder and chaos … then you cannot avoid learning to use Little’s Law. <Leslie> Wow! That is a profound insight. I will need to lie down in a darkened room and meditate on that! <Bob> An oasis of calm is the perfect place to pause, rest and reflect. [Beep] It was time for the weekly e-mentoring session so Bob switched on his laptop, logged in to the virtual meeting site and found that Lesley was already there. <Bob> Hi Lesley. What shall we talk about today? <Bob> So what is the problem? You know that is not the cause of chronic queues. <Lesley> Yes, I know that mantra is incorrect – but I do not yet understand how to respectfully challenge it and how to demonstrate why it is incorrect and what the alternative is. <Bob> OK. I understand. So could you outline a real example that we can work with. <Lesley> Yes. Another old chestnut: the Emergency Department 4-hour breaches. 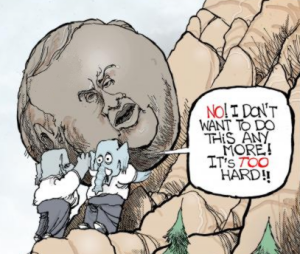 <Bob> Do you remember the Myth of Sisyphus? <Leslie> No, I do not remember that being mentioned in the FISH course. <Bob> Ho ho! No indeed, it is much older. In Greek mythology Sisyphus was a king of Ephyra who was punished by the Gods for chronic deceitfulness by being compelled to roll an immense boulder up a hill, only to watch it roll back down, and then to repeat this action forever. <Lesley> Ah! I see the link. Yes, that is exactly how people in the ED feel. Everyday it feels like they are pushing a heavy boulder uphill – only to have to repeat the same labour the next day. And they do not believe it can ever be any better with the resources they have. <Bob> A rather depressing conclusion! Perhaps a better metaphor is the story in the film “Ground Hog Day” where Bill Murray plays the part of a rather arrogant newsreader who enters a recurring nightmare where the same day is repeated, over and over. He seems powerless to prevent it. He does eventually escape when he learns the power of humility and learns how to behave differently. <Lesley> So the message is that there is a way out of this daily torture – if we are humble enough to learn the ‘how’. <Bob> Well put. So shall we start? <Bob> OK. As you know very well it is important not to use the unqualified term ‘capacity’. We must always state if we are referring to flow-capacity or space-capacity. <Lesley> Because they have different units and because they are intimately related to lead time by Little’s Law. <Bob> Yes. Little’s Law is mathematically proven Law of flow physics – it is not negotiable. <Lesley> OK. I know that but how does it solve problem we started with? <Bob> Little’s Law is necessary but it is not sufficient. Little’s Law relates to averages – and is therefore just the foundation. We now need to build the next level of understanding. <Lesley> So you mean we need to introduce variation? <Bob> Yes. And the tool we need for this is a particular form of time-series chart called a Vitals Chart. 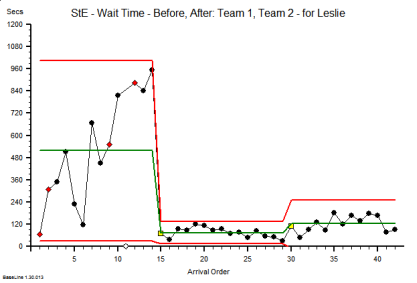 <Lesley> And I am assuming that will show the relationship between flow, lead time and work in progress … over time ? <Bob> Exactly. It is the temporal patterns on the Vitals Chart that point to the root causes of the Sisyphean Chaos. The flow design flaws. <Lesley> Which are not lack of flow-capacity or space-capacity. <Bob> Correct. If the chaos is chronic then there must already be enough space-capacity and flow-capacity. Little’s Law shows that, because if there were not the system would have failed completely a long time ago. The usual design flaw in a chronically chaotic system is one or more misaligned policies. It is as if the system hardware is OK but the operating software is not. <Lesley> So to escape from the Sisyphean Recurring ED 4-Hour Breach Nightmare we just need enough humility and enough time to learn how to diagnose and redesign some of our ED system operating software? Some of our own policies? Some of our own mantras? <Bob> Yup. And not very much actually. Most of the software is OK. We need to focus on the flaws. <Lesley> So where do I start? <Bob> You need to do the ISP-1 challenge that is called Brainteaser 104. That is where you learn how to create a Vitals Chart. <Lesley> OK. Now I see what I need to do and the reason: understanding how to do that will help me explain it to others. And you are not going to just give me the answer. <Bob> Correct. I am not going to just give you the answer. You will not fully understand unless you are able to build your own Vitals Chart generator. You will not be able to explain the how to others unless you demonstrate it to yourself first. <Lesley> And what else do I need to do that? <Bob> A spreadsheet and your raw start and finish event data. <Lesley> But we have tried that before and neither I nor the database experts in our Performance Department could work out how to get the real time work in progress from the events – so we assumed we would have to do a head count or a bed count every hour which is impractical. <Bob> It is indeed possible as you are about to discover for yourself. The fact that we do not know how to do something does not prove that it is impossible … humility means accepting our inevitable ignorance and being open to learning. Those who lack humility will continue to live the Sisyphean Nightmare of ED Ground Hog Day. The choice to escape is ours. <Lesley> I choose to learn. Please send me BT104.